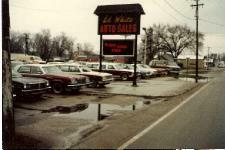 SJC Athletics has been renting vehicles from White's Auto Sales for many years. 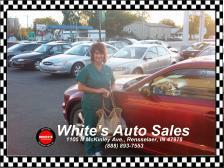 From compact cars, to mini vans, to 15 passenger vans they all have been great and the Staff is AWESOME!! 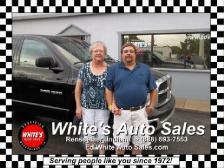 No need to go out of town to rent a vehicle, call White's Auto Sales and they can help you rent any type of vehicle!! We want to congratulate Shaun, Tiffany and the kids on the really cool 2001 Ford Explorer Sport Track they recently picked up here at White's! 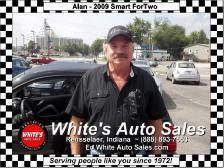 Shaun said he was surprised at the level of service White's offered and how well they were treated throughout the whole process of buying a new vehicle. That's what we do every day Shaun. We know how much of a hassle it can be. And we try to make it a little less stressful because all we want is for you to e happy. Dave was driving around and figured it was time to trade his current car in on something a little newer and nicer. So he drove right to White's Dave said that there was no second thought about who he was going to deal with, just what he was going to buy. 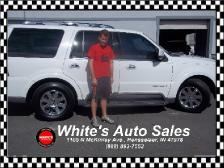 Because White's took so good care of him last time, he knew all he needed to do was tell us what he was looking for in his next vehicle and we would match him up with just what he wanted. Thanks for your confidence in us and thanks for being one of our many returning customers. We try to treat everyone just like family! I didn't come to White's because my uncle worked here. I came because i knew I could get a good car for the right price. 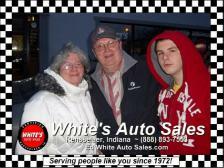 Now I am part of the White family too! Jim and Cindy were out looking for a vehicle that got them better gas mileage than the Chevy s10 Jim was driving to work. It was almost love at first sight all over again when Jim spied this Civic. 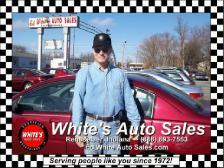 Jim says he has had his eye on a couple of cars on our lot and the time was just right to spring on one of them. The way White's worked with us really convinced Cindy that this was the right deal for us seeing that she is the banker of the family! 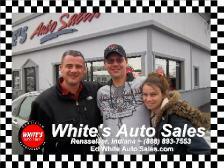 All of us here at White's hope you have a great time in your car! Eric just got back from Iraq where he was stationed for the last 5 months and needed a new vehicle. 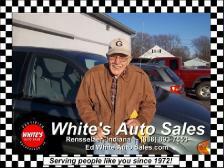 Everyone here at White's was honored to serve him this time with a fine vehicle. We would like to take this opportunity to thank all of those in the armed forces for the selfless service they give to this country. Your sacrifice on our behalf is not forgotten. 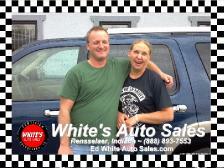 Dave knew right where to go when it came time to trade in his older Chevy Blazer on something different. He found just what he was looking for the same place he purchased the vehicle he was trading in. Dave said, he just had to come back because White's had just what he wanted at the right price. Plus, he likes to deal locally. Thanks for the support, and if anyone wants to take a look at insurance, see what Dave can do for you! just send him an email at: david.galt@infarmbureau.com You will be glad you did! Its going to be a very merry Christmas for Trudy. 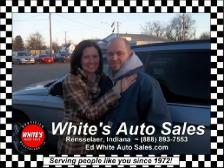 She has been wanting a Grand Cherokee for some time now and Jay finally gave in to her request! 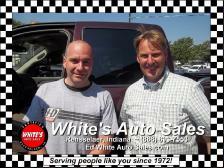 Jay said that they never buy new when used will do just as well and he has come to trust the cars he has found at White's. Jay is happy ... Trudy is happier ... everything is fine in their own little part of the world. That is all that matters. 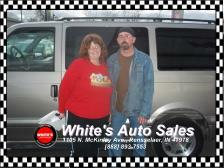 Not only are Jerry and Trina repeat customers, they came to get one last Christmas 2011 present. 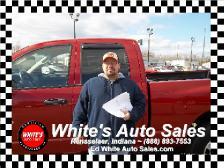 One for themselves ... a 2010 Chevrolet Silverado! As Trina said, "now our Christmas is complete!" 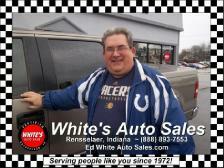 Now that's what we call an after-Christmas sale here at White's Auto Sales in Rensselaer! Today, it was Jonas and Vonette's turn in the spotlight! 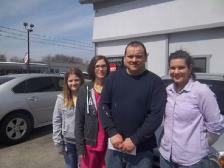 Tony is standing with them in front of the 2008 Ford Focus they bought from Tony this morning. Tina was not even planning to buy a car today ... but as fate would have it, she found the perfect one. 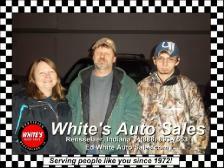 We have Doug, Tina and Tony mugging it up in front of Tina's 2005 Buick Rendezvous that she got from White's Auto Sales in Rensselaer, IN. We would like to introduce Gracie. 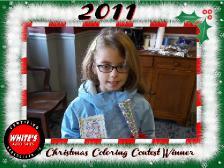 One of the winners of the Ed White 2011 Christmas Coloring Contest. She is here posing with her creation and prize package. 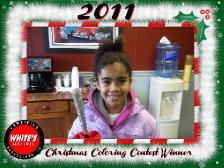 Let us introduce Ashanti, another one of our 2011 Ed White Christmas Coloring Contest winners! One of the last sales of 2011 and our first post of 2012. 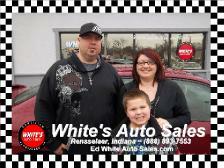 Allow me to introduce Bert, Jordan and their son standing in front of the 2005 Chevrolet Impala they just bought from White's Auto Sales in Rensselaer. Happy 2012 to everyone! 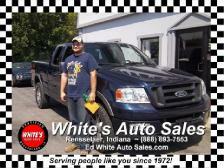 We proudly show Morgan in front of the 2003 Ford F-150 he just purchased from us here at White's Auto Sales. We know you are going to love it and thanks for being one of our customers. 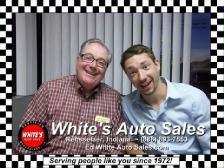 Douglas came to white's for 2 reasons ... 1) He was looking for a good car at a fair price. 2) Douglas is a Sox fan and on the off chance he could not get financed by Tony, he wanted to see Tony EAT his Cubs hat. Well guess what? Douglas got a good car and Tony had to get a sandwich because the hat is still on the wall of the sales office. We should probably dust it off! 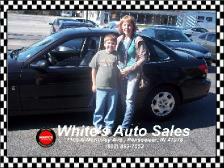 Allen just bought this cute car, a 2006 Hyundai Accent, for Shannon. With a wink in her eye, she told us about how their salesman, Tony, kicked them; pushed them around; screamed and spat at them until they took the car. Then she let us know how happy both of them are with her new set of wheels. Everybody likes a kidder! Thanks for brightening up our day. 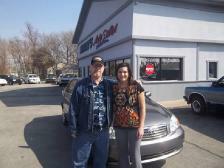 We hope you love your car and we look forward to seeing you again sometime! 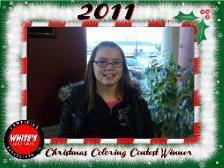 Our latest winner of the Ed White's 2011 Christmas Coloring Contest just came in to claim her prize.. Please join us in congratulating Shayana on a job well done! 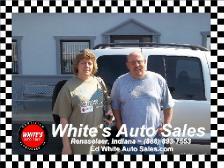 We want to welcome Judy and Larry to the White's family with the purchase of this beautiful 2004 Dodge Durango. This customer, who wishes to remain anonymous, just picked up THIS 2004 Chevrolet Impala from us here at White's Auto Sales in Rensselaer. Even though he did not live here in town, he said it was worth the trip here AGAIN to buy from us. He traded in the car he purchased here last time for this one today. We respect his privacy, and he is still part of the White's family! It is not often we get to do something REALLY special for a really nice couple. 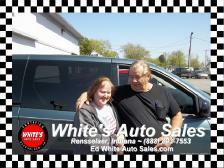 This is one of those time ... White's Auto Sales in Rensselaer take great pride in introducing, for the very first time to everyone who sees this ... Connie & Bob, who were recently married and chose to see us fo the 2003 Chrysler Town and Country they are standing in front of. We hope this van is just like you ... filled with love and it lasts forever! 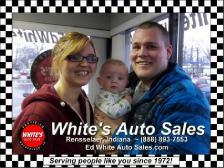 We would like to introduce the latest person to join the White's Auto Sales family. 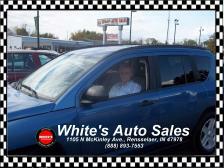 Here is Paul in front of the 2008 Pontiac G5 he just picked up. He was referred to us by one of our other happy customers ... and now that customer will be even happier! A $100 referral check is on it's way to them for recommending Paul to us. How would you like to earn easy money by telling your friends about us? 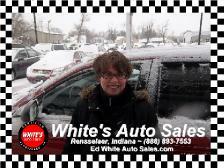 It may have been a snowy day here in Rensselaer, but Donna sure warmed it up when she came in to purchase her 2005 Chevrolet Equinox from Tony. 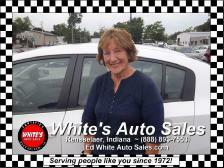 Donna said that she hated to trade in her old car, but she made the drive over to White's in Rensselaer because she just knew we had just what she was looking for. Thanks for coming in and buying today. Just having you smile in the office made everyone forget it was cold and snowing outside! Well, another truck rolled off the lot today! 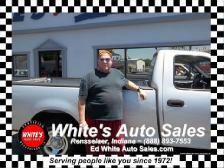 Let us introduce Bud standing in front of the 2001 Chevrolet S-10 he just got from us here at White's Auto Sales in Rensselaer. Bud did a lot of looking and found just what he wanted on our lot. 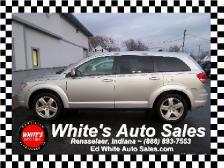 Denise is a little shy, so we are leaving her out of the picture, but here is a good shot of the beautiful 2009 Dodge Journey she just took delivery of here at White's Auto Sales in Rensselaer, Indiana. Denise said just how well she was treated by everyone here. In her own words, "everyone was really nice." "They made this whole transaction quick and painless." That's just the way we try to make it for everyone! What better thing to do on a snowy January day? Go sledding? Sit by a fire sipping hot chocolate? How about buy a shiny red 2004 Chrysler Pacifica? That's what Trea did today! She called us up and told us that today was the day she wanted to buy. So, being the fun loving people we are, we jumped in a car and picked her up so she could buy her car. While Trea feels special, we like to think we treat all of our customers like we treated her. We try to make it easy and kinda' fun to buy a car. 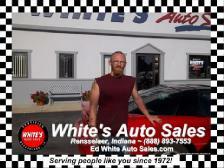 That's what maked White's Auto Sales different. 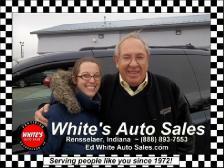 Well, the snow cleared up this afternoon and Cassie came in to pick up her 2005 Chevrolet Equinox. 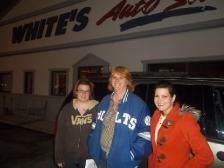 We sure hope she enjoys it as much as we enjoyed helping her pick out and purchase her next vehicle here at White's Auto Sales in Rensselaer! 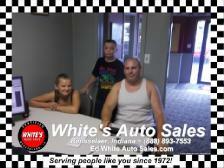 We would like to introduce the latest member of the White's Auto Sales family. 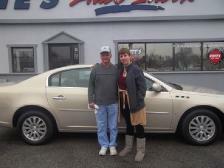 We welcome Sharon standing next to the beautiful 2006 Buick Lucerne she just purchased from us. This is what we call a long time customer. 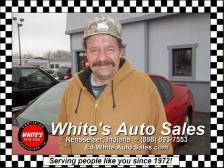 This fine young man has been a loyal customer of White's Auto Sales for the last 20 years. 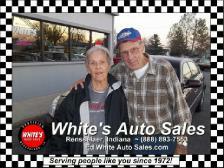 So when he needed another car, in this case a 2007 Pontiac G6, he came right back to White's. We hope to be around for another 20 years. Thanks for putting your trust in us. Were we surprised to Mack and his wife this morning. His truck gave out and he needed another, so he came in to see us and we didn't let him down. 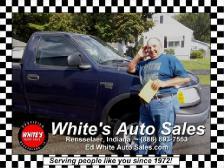 Here he, all smiles, in front of his "new" 2005 Ford Ranger. You may not know this from looking at him, but he is also the pastor of the church that meets every Sunday at the Ritz Cinema at 116 S. Van Rensselaer Street here in Rensselaer. The church is called the Northern House of Worship and is geared to those who do not feel comfortable in a regular church. For more information, you can reach him or his wife almost every night at the Ritz. 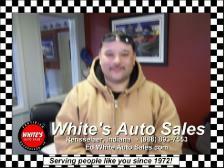 J B Equipment Company in Morocco, Indiana is one of our regulars here at White's Auto Sales in Rensselaer. 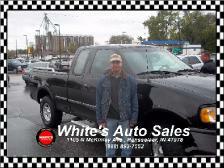 Here is one of their drivers in front of the 2005 Ford F-350 Crew Cab they just bought. Come in and see why J B Equipment comes to us for their vehicles. We will treat you like we treat them. If you need custom corrosive chemical resistant linings, coatings or tanks, see J B Equipment in Morocco, Indiana. 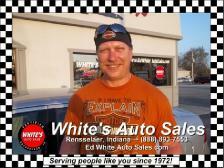 Call them at (219) 285-0668 and tell 'em White's sent you. 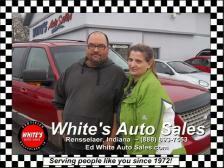 We would like to introduce Ernestina and her husband in front of the 2007 Chevrolet Equinox they just purchased from us here at White's Auto Sales in Rensselaer. 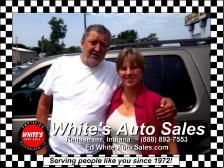 From time to time, White's Auto Sales in Rensselaer, Indiana offers a vehicle for sale on eBay. We would like to introduce our newest member to the White's Family. 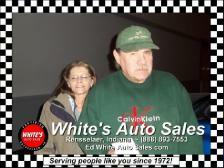 This is Rick, all the way from Rochester, Minnesota in front of the 2008 Ford F-450 he had the winning bid for on eBay. 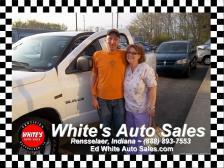 He was all giddy to get such a great truck for so little. He told us that he was expecting to drive all the way to Texas or Arizona and was expecting to pay much more. We would like to introduce Cynthia (she is the one with the RED hair!) 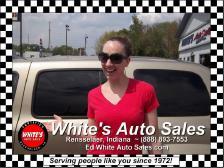 while she is standing in front of the wonderful white 2550 GMC Envoy she just picked up here at White's Auto Sales in Rensselaer, Indiana. 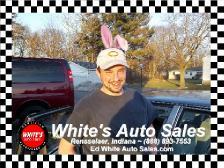 Here is Eric, one of our employees (hence the bunny ears!) 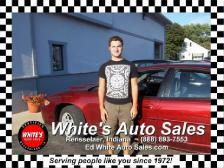 in front of the 1995 Buick LeSabre he just bought here at White's Auto Sales in Rensselaer, Indiana. He fell in love with it while checking it out in the shop and had to have it. We hope you are "HOPPY" with it Eric! We would like to introduce Darren. He is our latest customer. 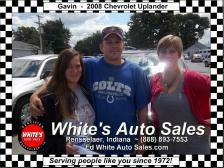 He is here with the 2006 Chevrolet Avalanche he just bought from us here at White's Auto Sales, in Rensselaer, Indiana. 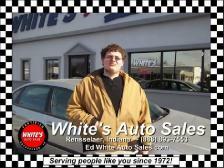 Douglas proves it makes sense to make the trip to White's Auto Sales in Rensselaer. 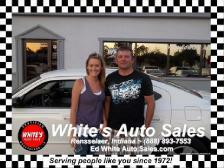 He drove over 40 miles just to get this 2003 Saturn Ion from us. Thanks Doug! We would like to wish Gene and his lovely bride here a happy 50th Anniversary (though it is 1 year early). 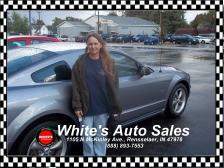 They are standing in front of the 2007 Ford Mustang he just bought her for an anniversary gift from us here at White's Autoo Sales in Rensselaer. We proved we sell just about everything when the good people of D.I.G. 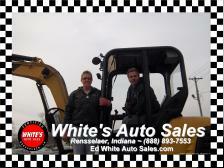 Excavating in Plymouth, Indiana picked up this 2001 Caterpillar Mini Excavator Model 302.5 from us here at White's Auto Sales in Rensselaer, Indiana. 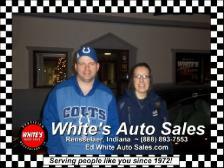 Catching up from a busy weekend ... May we introduce Tim & Becky with the 2003 Hyundai Santa Fe they just picked up here at White's Auto Sales in Rensselaer, Indiana. Still catching up ... it really was busy here Saturday. 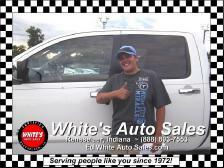 This is James in front of the stunning 2005 Dodge Dakota he took home with him that he got here at White's Auto Sales in Rensselaer, IN. STILL! catching up ... 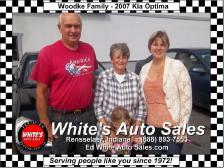 Here is Lillian with the beautiful 2005 Kia Optima she got from us at White's Auto Sales in Rensselaer, Indiana. Finally! 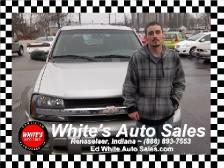 This is Michael with the 2004 Chevrolet Trailblazer he took home with him from us here at White's Auto Sales in Rensselaer, Indiana. 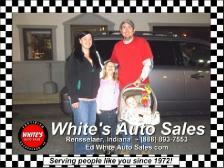 Let me be the first to introduce William and Amanda (along with their little one) standing beside the 2002 Chevrolet Impala they just bought at White's Auto Sales in Rensselaer, Indiana. 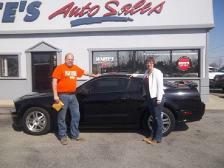 May I introduce Deb & Forrest standing in front of the green 2007 Ford Taurus they just purchased from White's Auto Sales in Rensselaer, Indiana. 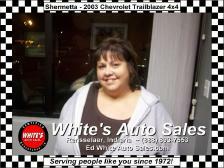 May I introduce Kim standing beside the 1999 Chevrolet Caviler she just purchased from White's Auto Sales in Rensselaer, Indiana. 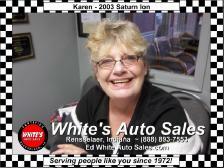 We want to congradulate Carol Sue on making her last payment this morning on the Saturn Ion she bought from us here at White's Auto Sales in Rensselaer. 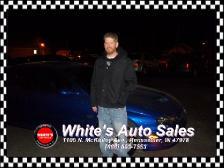 We would like to introduce Mike beside the 2007 Ford Taurus he just purchased from us here at White's Auto Sales in Rensselaer, IN. 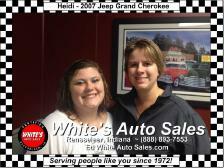 May we introduce Kim and a friend of hers as she got ready to drive away in the 2003 Suzuki XL7 she just picked up at White's Auto Sales in Rensselaer, Indiana. 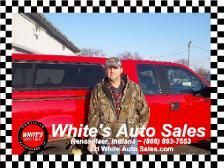 May we take this opportunity to introduce Bruce, standing next to the cherry red 2005 Ford F-150 4X4 Supercab he just purchased from us here at White's Auto Sales, in Rensselaer, Indiana. 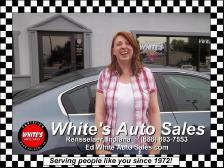 We came to White's looking for a second car that we could count on that fit into our budget. White's really came through for us. All I can say is HOTTTTTTTTT! 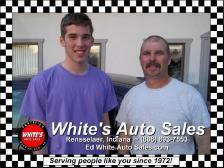 The guys at White's treated me with courtesy and respect and got me into a car I can count on. Just like I was counting on them to take care of me. 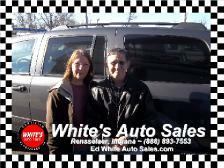 May we introduce Teresa and Robert with the 2006 Chevrolet Uplander they just purchased from us at White's Auto Sales in Rensselaer, Indiana. Now this is one shrewd shopper. Ed snatched this one up even before we got it into inventory! With such a large inventory that is constantly changing, if you don't grab the car you have your eye on today, it may just ... slip away! 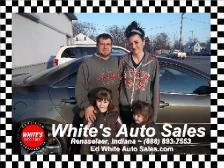 May we introduce Melissa, Troy and family beside the 2005 Chrysler Sebring they just picked up from us here at White's Auto Sales in Rensselaer, Indiana. The right truck. The right price. The right way to treat a customer. 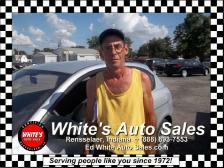 May we introduce Bud beside the 2004 Dodge Stratus R/T just bought from us here at White's Auto Sales in Rensselaer, Indiana. White's took great care of me. They made sure I had a reliable and SAFE car before I left the lot. Now I have a reliable car at a fair price at a price I can afford! 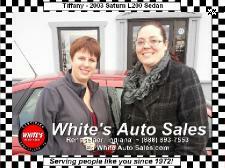 May we introduce Amber and Donna next to the 2002 Saturn LS-L200 that was just purchased from White's Auto Sales in Rensselaer, Indiana. 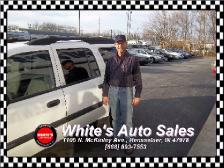 May we introduce Larry with his salesman Gene, beside the 2004 Pontiac Montana Larry just purchased from White's Auto Sales in Rensselaer, Indiana. Now there is a way to make a pretty girl smile. Give her the set of keys to a hot Impala SS! A nice car for an even nicer couple. 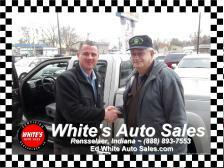 May we intorduce Willie with his salesman Tony next to the 2007 Chevrolet Colorado Crewcab 4WD pickup he just bought from us here at White's Auto Sales in Rensselaer, Indiana. 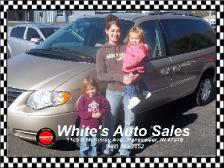 Jeff and Samantha went "hunting" for the perfect minivan for the family and stalked this one on our lot. Good job - you "bagged" a good one! Nice wheels for not a lot of "bucks". 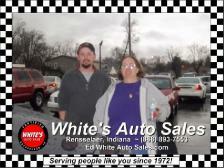 May we introduce Shanda & Tony beside the 2005 Pontiac Grand Prix they just picked up at White's Auto Sales in Rensselaer, Indiana. 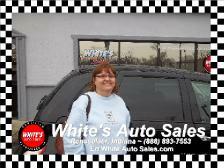 Here is Pauline with her new 2005 Chevy Trailblazer. Now she is ready for everything nature has to throw at her through the winter as well as ride in style to her family's house for the holidays. Good choice Pauline! Hope you like it! 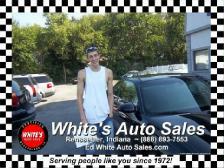 May we introduce Matthew beside the 2007 Ford Focus ZX4 he picked up from us here at White's Auto Sales in Rensselaer, Indiana. Gene took something that is not always a pleasant thing to do and made it almost fun. Everyone at White's went out of the way to make us comfortable. Donny was driving by and as luck would have it, this DAZZLING blue GTO stared him down like snake eyes! His car was good but he knew the difference between holding on to what he had and folding for another car. He wheeled into White's and he was treated like a high roller. Then minutes later, we hit him with an offer he could not refuse. Today, he is driving the strip like a king. Thanks Donny! We know you are going to like the car. 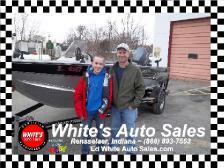 May we introduce Ted and his son beside the Alumacraft Magnum 175 fishing boat they just picked up from us at White's Auto Sales in Rensselaer, Indiana. 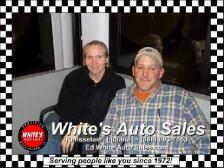 I was comfortable buying at White's because of the comfortable and very relaxed atmosphere. Thanks Don. And all of us hope you enjoy your family and that great Thanksgiving ham you were telling us about! Charity finally got the car she always wanted! 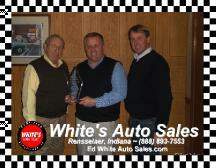 Ed and Troy White were honored today for White's Auto Sales outstanding relationship and quality work done for ASC Warranty. 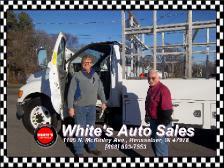 ASC is the company that underwrites the extended service contracts that have been sold at White's Auto Sales for over the last 14 years. Just the car I needed! Thanks Gene! 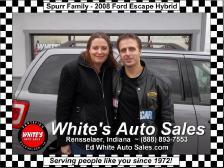 Gerry & Rita are a little shy but here is a photo of the 2007 Ford Escape they just picked up from us at White's Auto Sales in Rensselaer, Indiana. 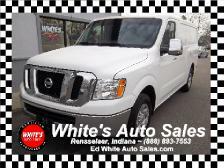 White's had the exact vehicle we wanted at a fair price. PLUS, Tony and Gene were great to deal with! 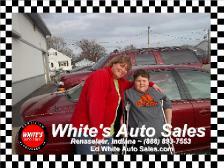 May we introduce Angela and her son beside the 2003 Buick Century she just picked up from us here at White's Auto Sales in Rensselaer, IN. Edward says they love the new van. All we can say is "Good luck with the triplets"! Ben (one of our mechanics) - 2012 . .
Congrats to Ben, one of our mechanics. 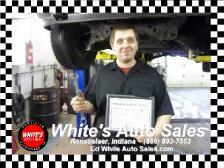 He is pictured here with his certificate from a professional mechanics school he just attended and his favorite wrench! 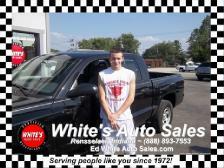 All Jenniffer can say is she is now driving the best looking Ram in town. 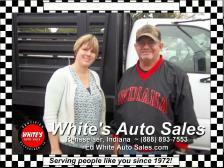 My we introduce Tom & Sonia Friend, owners of Friend Irrigation in Columbia City, IN, beside the 2006 Ford F-250 SD with a Stahl utility box they just purchased for their business from us at White's Auto Sales in Rensselaer, IN. I really don't know if they are smiling about the new car or the great deal they just got. All I know is that there goes another happy couple. 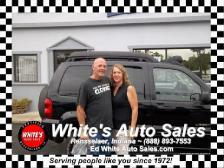 May we introduce Jennifer and Larry in front of the 2006 Chevrolet Trailblazer they just picked up from us here at White's Auto Sales in Rensselaer, Indiana. 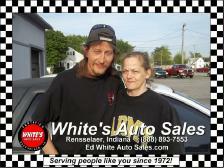 They drove all the way from Hartford City just to get the White's deal. 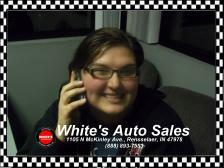 Here is Stephanie on the phone telling her friends about how well she wast treated by everyone at White's. You are no different from anyone else. We treat EVERYONE like family. 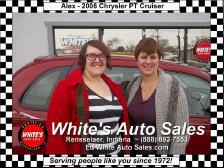 May we introduce Vick and Kimberly beside the 2004 Cadillac SRX they just took delivery of from White's Auto Sales in Rensselaer, IN. A man. A smile. A great set of wheels! This picture says everything. 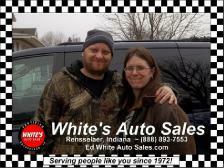 May we introduce Jerry & Julie behind the 2007 Chrysler Town & Country they just bought from us at White's Auto Sales in Rensselaer, Indiana. We made a bit of a drive with no intention of buying right away. 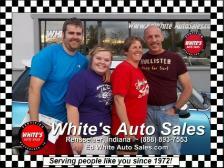 But the deal White's offered us and the way they made us feel like family ... the only thing we could say is YES! My wife loves her Pacifica! We will be back and are bringing our friends next time! 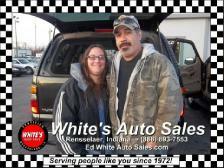 May we introduce Kate & Jimmie beside the 2006 Jeep Commander they just picked up from us at White's Auto Sales in Rensselaer, IN. Tony did it again! 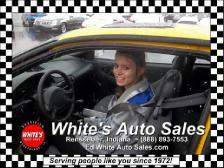 This is my second vehicle from White's and as long as they are around, I will be buying my cars from them! 10/20/2011 Ok ... we are back to 4X4's. Dennis just picked up the GORGEOUS! 2008 Suzuki XL7. I mean there is not one more option they could have added at the factory to this one. 3 rows of seats and good gas mileage wrapped up in a neat looking package. Way to go Dennis! 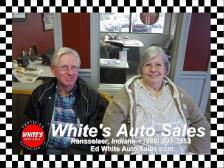 May we introduce Glenda & Carl beside the 2003 Jeep Liberty Sport 2WD they just purchased from us at White's Auto Sales in Rensselaer, Indiana. 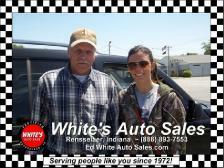 10/20/2011 We got a break from 4X4's with the dad and daughter that are driving away in this sporty little Ford! Good job and great wheels! 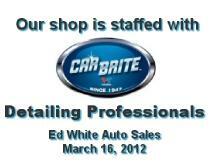 We are proud of the men in our detail shop here at White's Auto Sales in Rensselaer, Indiana. They just completed a day long seminar from one of our suppliers on how to do a better job and work more effectively. Good job guys! 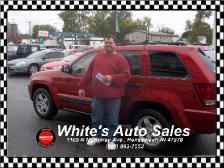 10/20/2011 Then came Jimmy in his bright red Jeep Grand Cherokee! 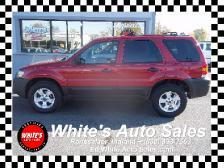 Looking like it is 4 X 4 day here at White's Auto Sales! 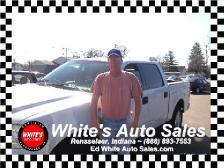 May we introduce Jeff beside the 2004 Ford F-150 Super Crew he just purchased from us here at White's Auto Sales in Rensselaer, Indiana. 10/20/2011 First delivery of the day!! 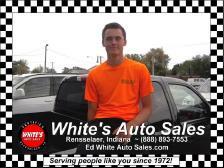 Patrick beside the 1997 Ford F-150 he just bought from White's Auto Sales in Rensselaer. Way to go Patrick! 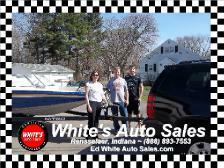 May we introduce Gail, Mark and their son, beside the 2004 Tracker Nitro 185 Sport fish & ski boat they bought from us at White's Auto Sales in Rensselaer, IN through our listing on eBay. 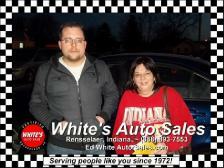 My mom and I were looking for the right car and we found it at White's. Way to go Tony & Gene! 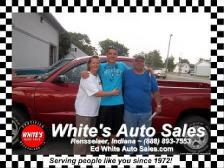 May we introduce Dewey and his girlfriend beside the 2007 Chevrolet Silverado 4WD he just bought from us here at White's Auto Sales in Rensselaer, IN. Not only did they have the truck I was looking for, but they BEAT my credit union on financing! That is really FULL service. 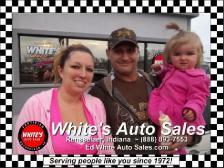 May we introduce Chris and his daughter beside the 2009 Chevrolet Cobalt he just bought from us here at White's Auto Sales in Rensselaer, Indiana. This was the first car I have ever purchased. 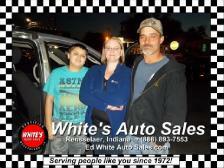 Everyone at White's made it easy and stress free. May we introduce Stephanie in the 2007 Mazda 6 she just purchased from us here at White's Auto Sales in Rensselaer, IN. 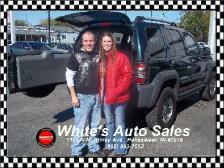 When I needed a safe and reliable Jeep for my wife, my first thought was White's. They got me the Jeep I wanted for her at a fair price. 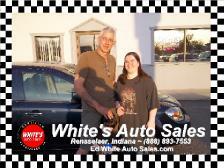 This is our picture of Dave and Ashley driving away in the 2006 Pontiac G6 they just picked up from us here at White's Auto Sales in Rensselaer, Indiana. 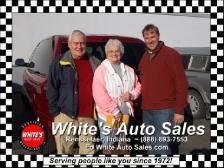 The guys at White's got us the right car at the right price. It was a pleasure doing business with them ... AGAIN! 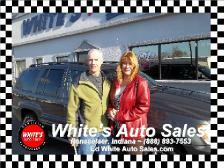 May we introduce Brian & Vickie beside the 2007 Chrysler Town & Country the just picked up from us here at White's Auto Sales in Rensselaer, IN. It was worth the drive all the way from St. Charles, Illinois. 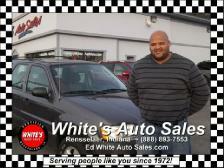 May we introduce Jerry beside the 2008 Toyota Yaris he just bought from us here at White's Auto Sales in Rensselaer, IN. 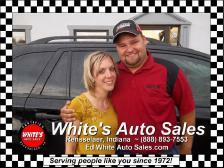 May we introduce Jerry & Erica standing beside the 2007 Ford Explorer Eddie Bauer Edition he just purchased from us here at White's Auto Sales in Rensselaer, Indiana. 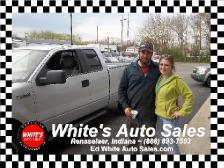 May we introduce Ashton & Cody beside the 2006 Ford F-150 Super Cab 4WD they just bought from us at White's Auto Sales in Rensselaer, Indiana. BRIGHT ... RED ... ZOOOOOOOM! 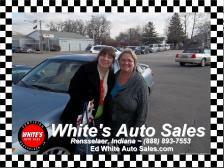 May we introduce Sherry and a friend of hers beside the 2007 Mazda 6 she just bought from White's Auto Sales in Rensselaer, IN. We are going to tell our friends how well we were treated th White's. They even treated Moonbeam like one of the family! 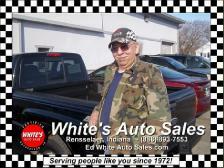 May we introduce Eugene next to the 2008 Dodge Ram 1500 he just purchased from us at White's Auto Sales in Rensselaer, Indiana. 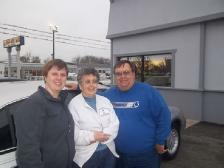 May we introduce Marcia and Gary with some more of the family beside the 2005 Pontiac Montana they just bought from us at White's Auto Sales in Rensselaer, IN. Great truck. Great price. Great Customer service! 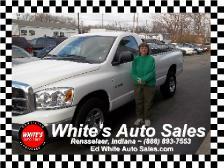 May we introduce Amy and AJ beside the 2008 Dodge Ram 1500 they just got from us at White's Auto Sales in Rensselaer, IN. 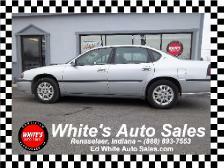 A great car at a fair price with a warranty too! What more could we ask for? 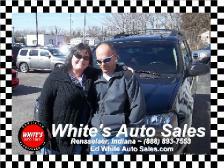 May we introduce Sandra and Richard beside the 2007 Dodge Grand Caravan they just picked up from White's Auto Sales in Rensselaer, Indiana. White's went the extra mile to get us into a good car at a price we could afford! 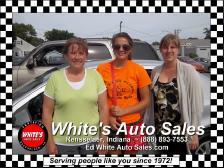 May we introduce Shanda, her daughter Harmony and mother Audra, beside the 2005 Pontiac G6 they just got from White's Auto Sales in Rensselaer, Indiana. 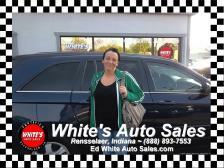 May we introduce Brandi beside the 2005 Chrysler Pacifica Touring AWD she just purchased from us at White's Auto Sales in Rensselaer, IN. 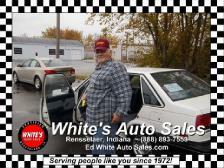 Let me try this again ... May we introduce Robert in front of the 2001 Buick Century he just purchased from us at White's Auto Sales in Rensselaer, IN. 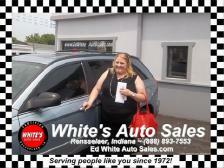 May we introduce Cynthia standing beside the 2005 Kia Sedona she just purchased from us here at White's Auto Sales in Rensselaer, Indiana. 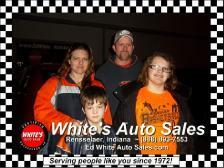 May we introduce Don, Margaret and their family beside the 2008 Saturn Vue they just purchased from us here at White's Auto Sales in Rensselaer, IN. 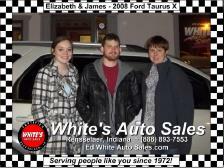 May we introduce Kent & Amanda with the 2008 Ford Taurus X they just got from us here at White's Auto Sales in Rensselaer, Indiana. 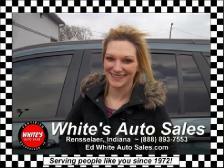 May we introduce Brittany beside the 2006 Chrysler PT Cruiser she just purchased from us at White's Auto Sales in Rensselaer, IN. 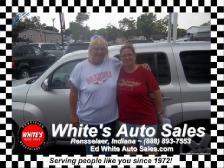 We would like to introduce Jenny, beside the 2006 Chevrolet Trailblazer she just bought from us at White's Auto Sales in Rensselaer, IN. 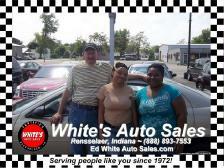 May we introduce Jeffery, Marilyn & their daughter(center) beside the 2006 Chrysler Town & Country they just purchased from us here at White's Auto Sales in Rensselaer, IN. 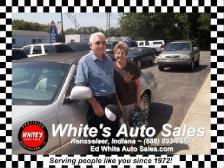 May we introduce Mr. & Mrs. Lopez beside the 2010 Chevrolet Malibu they just purchased from us at White's Auto Sales in Rensselaer, Ind. 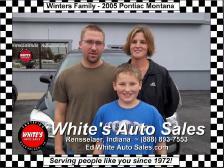 May we introduce Melissa, Dave and their son, beside the 2004 Pontiac Montana they just purchased from us at White's Auto Sales in Rensselaer, IN. 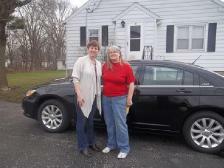 May we introduce Lori & Mary Ann beside the 2001 Chrysler Sebring they just bought from us at White's Auto Sales in Rensselaer, Indiana. 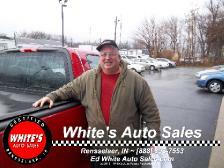 May we introduce Bill from Autumn Builders here in Rensselaer, beside the 2005 Ford F-150 he just purchased for his crew from us at White's Auto Sales in Rensselaer, IN. 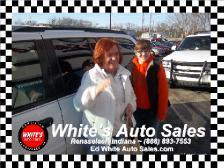 May we introduce Marcy beside the 2005 Chrysler Pacifica she just purchased from us here at White's Auto Sales in Rensselaer, Indiana. 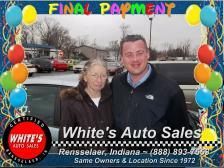 May we introduce Mary & Jeff beside the 2011 Ford Focus they just purchased from us here at White's Auto Sales in Rensselaer, IN. 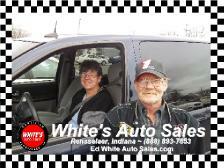 May we introduce Dennis & Sandra, the owners of a 2001 Dodge Grand Caravan that they just purchased from us here at White's Auto Sales in Rensselaer, IN. 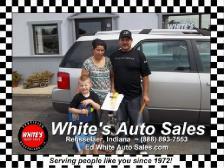 May we introduce Kellen beside the 2007 Chrysler Pacifica he just purchased for his family from us here at White's Auto Sales in Rensselaer, IN. 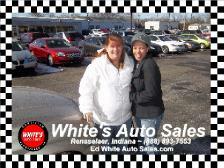 May we introduce Sharon & Lindsay standing beside the 2005 Pontiac G6 they just purchased from us at White's Auto Sales in Rensselaer, Indiana. 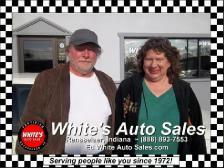 May we introduce Trinka & Mike beside the 2003 Chrysler PT Cruiser they just bought from us at White's Auto Sales in Rensselaer, IN. 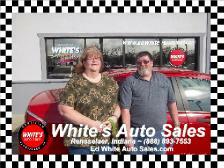 May we introduce Diane and Paul in front of the 2008 Chevrolet Impala they bought during Impala-Palooza at White's Auto Sales in Rensselaer, IN. 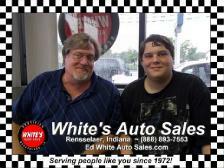 May we introduce Brett beside his son Carson beside the 2004 Chevrolet Monte Carlo SS they just picked up from us at White's Auto Sales in Rensselaer, Indiana. 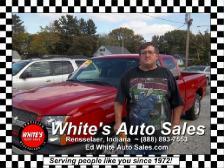 May we introduce Wayne standing beside the 2008 Dodge Ram 1500 he just purchased from us here at White's Auto Sales in Rensselaer, IN. 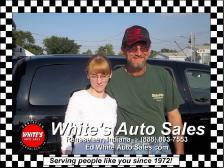 May we introduce REPEAT customers, Tom & Valerie beside the 2004 Dodge Dakota they just purchased from us here at White's Auto Sales in Rensselaer, Indiana. 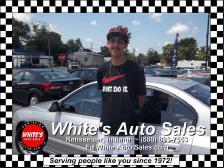 May we introduce Francisco beside the 2008 Chevrolet Impala he just purchased during our Impalapalooza Sale at White's Auto Sales in Rensselaer, Indiana. 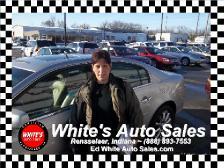 We would like to introduce Sharon beside the 2007 Lincoln Town Car she drove from Illinois to buy from us at White's Auto Sales in Rensselaer, IN. She liked the way we did business and the we she was not "hounded" by us. 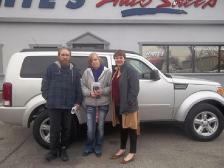 We hope you enjoy your new car Sharon. We enjoyed doing business with you. 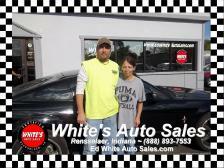 May we introduce repeat customers, Todd & Cheryl, standing proudly beside the awesome 2008 Ford Mustang they just purchased from us at White's Auto Sales in Rensselaer, IN. 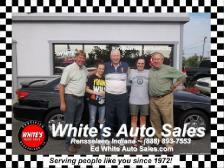 We want to thank Emma for dropping in again to purchase this stunning 2009 Chevrolet Impala. She has been a loyal customer for 30 years and has shopped nowhere else. 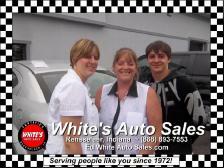 Thanks for your loyalty ... we are proud to serve customers like you here at White's Auto Sales in Rensselaer, IN. 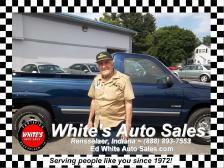 May we present Eric beside the stunning 2000 Dodge Dakota 4WD he just purchased from us here at White's Auto Sales in Rensselaer, Indiana. 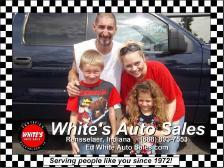 May we introduce Chucky and his wife beside the 2004 Ford Expedition they just bought from us at White's Auto Sales in Rensselaer. The liked the way they were treated and the deal so much last time that they came back for this truck. Thanks! 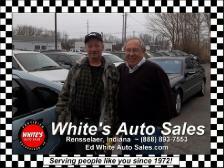 May we introduce an old friend, Jerry, standing with Ed in front of the 2010 Chevrolet Malibu she just bought from us here at White's Auto Sales in Rensselaer, IN. 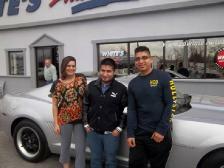 We just love it when people keep coming back to us because they can trust us for a good car. Thanks Jerry! 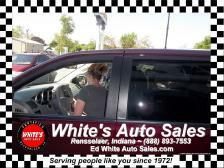 She is a little shy, but here is Amber, getting ready to drive away in the 5th vehicle she has purchased from us at White's Auto Sales in Rensselaer, Indiana, a 2009 Dodge Grand Caravan. 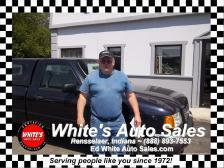 May we introduce Johnny beside the 2002 Ford Ranger he just got from us here at White's Auto Sales in Rensselaer, Indiana. 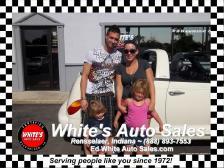 May we introduce Amanda & her family beside the 2005 Chrysler PT Cruiser convertible she just bought from us here at White's Auto Sales in Rensselaer, IN. 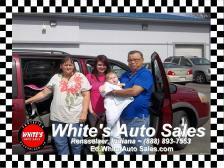 May we introduce Matt, Crystal & Family beside the 2004 Chevrolet Trailblazer they just got from us here at White's Auto Sales in Rensselaer, Indiana. 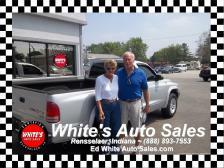 May we introduce Robert & Nancy with the 2005 Chevrolet Silverado they just got from us here at White's Auto Sales in Rensselaer, IN. 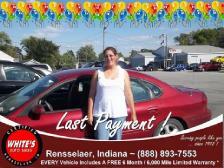 May we introduce Teannedra and her friends beside the 2004 Chrysler Sebring she just got from us here at White's Auto Sales in Rensselaer, IN. 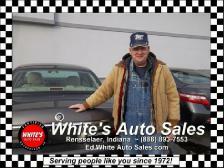 May we introduce Benny with the 2009 Chevrolet Malibu he just purchased from us here at White's Auto Sales in Rensselaer, Indiana. 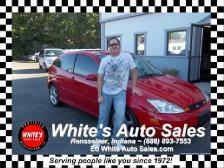 May we introduce Kenny with the 2008 Honda Civic he purchased from us here at White's Auto Sales in Rensselaer, Indiana. 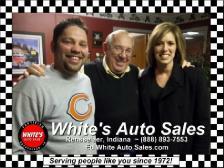 White's Auto Sales is celebrating 40 years serving Jasper & the surrounding counties with a month long celebration. 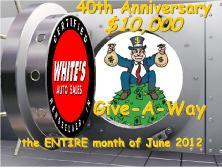 All the month of June 2012, there will be GREAT Give-A-Ways, Door Prizes and GREAT DEALS on the ENTIRE inventory. Plus, if you are 18 or older, you can try your hand at Ed's safe and try to win $10,000! 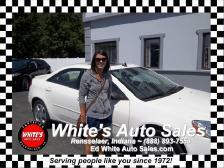 May we introduce Arica beside the 2008 Pontiac G6 she recently purchased from us here at White's Auto Sales in Rensselaer, IN. 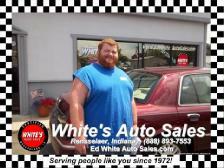 May we introduce Todd & a friend beside the 2008 Nissan Sentra he just bought from us at White's Auto Sales in Rensselaer, Indiana. 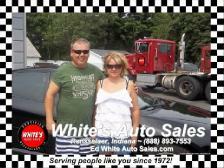 May we introduce Byron & Tammie beside the 2007 Mercury Milan they just purchased from us here at White's Auto Sales in Rensselaer, IN. 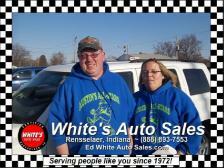 Make plans NOW to come in to White's Auto Sales in Rensselaer for our HUGE 40th Anniversary Celebration. There will be door prizes and even a chance to win $10,000 if you can crack the combination to Ed's Vault. There is no purchase necessary, but we ARE offering GREAT deals on every car on the lot. 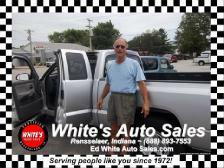 May we introduce Jim beside the 2002 Chevrolet Silverado he just purchased from us here at White's Auto Sales in Rensselaer, IN. 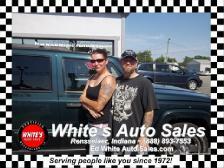 May we introduce Joe beside the 2006 Toyota Tacoma he just purchased from us here at White's Auto Sales in Rensselaer, Indiana. 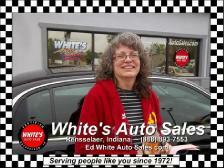 Join us for White's Auto Sales 40th Anniversary Celebration, going on now through June 30th. There are door prizes, expanded hours and even a chance to break into Ed's Vault and walk away with $10,000! Hurry in. 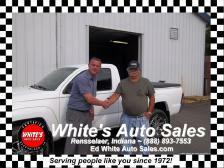 May we introduce mark beside the 2006 Chevrolet Colorado he just purchased from White's Auto Sales in Rensselaer, Indiana. 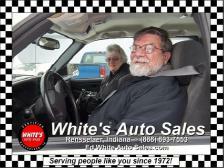 NOW through June 30th ... celebrate White's Auto Sales 40th Anniversary serving the people of Jasper & surrounding counties. There are great deals, door prizes and you have a chance to crack open Ed's Vault with $10,000 in it. 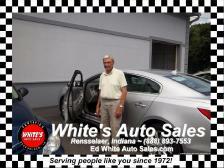 May we introduce Frank with the stunning 2012 Buick LaCrosse he just purchased from us here at White's Auto Sales in Rensselaer, IN. 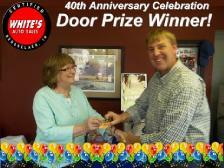 May we introduce Judy, the FIRST door prize winner in White's Auto Sales 40th Anniversary Celebration. Judy is being presented with a $150 gift card to Strack and Van-Til. Stop in and register. We will have a weekly drawing for a door prize. PLUS++ you can try to crack the combination on Ed's Safe and walk away with a cool $10,000! 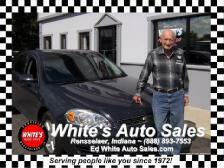 May we introduce Frank beside the 2012 Buick LaCrosse he purchased from us here at White's Auto Sales in Rensselaer, IN. 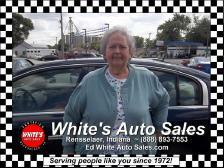 May we introduce Judy beside the 2007 Chrysler PT Cruiser she purchased from us here at White's in Rensselaer where we are celebrating 40 years of sales & Sales to the people of Jasper & surrounding counties. 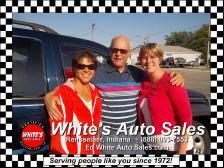 May we introduce Debbie & John beside the 2008 Ford Escape they just purchased from us here at White's Auto Sales in Rensselaer, Indiana. 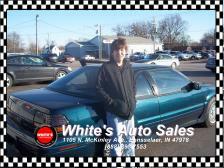 May we introduce Devin, in the 2002 Pontiac Grand Prix he bought from us here at White's Auto Sales in Rensselaer, IN. 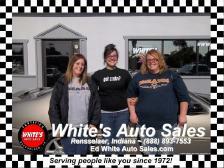 May we introduce Brittany & Casey beside the 2007 Dodge charger he recently purchased from us here at White's Auto Sales in Rensselaer, Indiana. 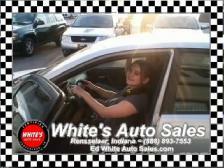 We would like to introduce Jessica beside the 2006 Pontiac Grand Prix she purchased from us here at White's Auto Sales in Rensselaer, IN. 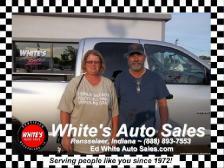 We are happy to introduce Dawn & Robert beside the 2006 Dodge Ram 1500 4WD they bought from us here at White's Auto Sales in Rensselaer, Indiana. 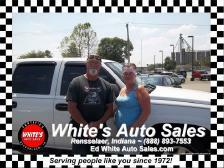 May we introduce Michelle & Larry beside the 2006 Chevrolet Silverado 2500HD they purchased from us here at White's Auto Sales in Rensselaer, Indiana. 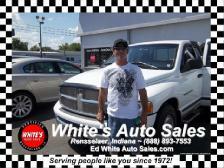 May we introduce Kenny beside the 2002 Ford F-150 he purchased from us here at White's Auto Sales in Rensselaer, Indiana. 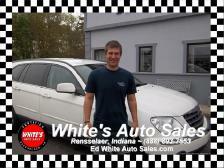 May we introduce Kevin with the 2006 Chrysler Town & Country he recently purchased from us here at White's Auto Sales in Rensselaer, IN. 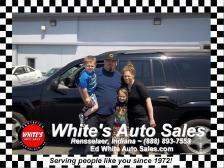 We would like to introduce Melissa, Tim and their son, beside the 2008 Dodge Durango they purchased from us here at White's Auto Sales in Rensselaer, Indiana. 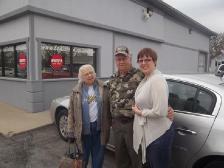 May we introduce Jerry & Trina beside the 2011 Chevrolet Malibu they purchased from us at White's Auto Sales in Rensselaer, IN. 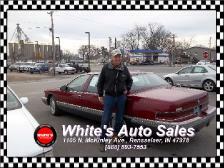 May we introduce Clint with the 2006 Mercury Grand Marquis he purchased from us here at White's Auto Sales in Rensselaer, IN. 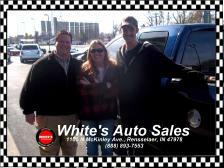 May we introduce Donna, Zack & Carey beside the 2006 Dodge Dakota they picked up from us here at White's Auto Sales in Rensselaer, IN. 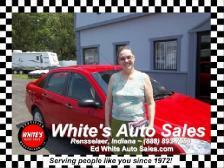 May we introduce Barb with her 2007 Ford Focus she purchased from us at White's Auto Sales in Rensselaer, IN. 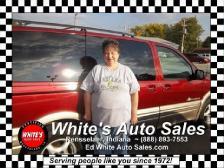 May we introduce Donna beside the 2004 Chevrolet Caviler she purchased from us here at White's Auto Sales in Rensselaer, Indiana. 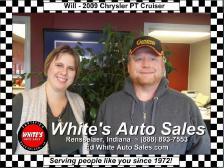 May we present Nikki and Dan beside the 2007 Chevrolet Silverado they purchased from us here at White's Auto Sales in Rensselaer, IN. 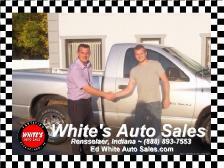 May we introduce John in front of the 2002 Dodge Ram 1500 he purchased from us here at White's Auto Sales in Rensselaer, IN. 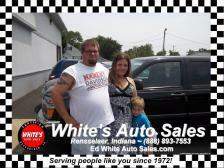 May we introduce Bayron and his family beside the 2008 Chrysler 300 they purchased from us at White's Auto Sales in Rensselaer, Indiana. 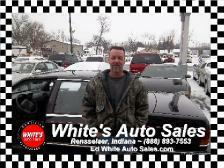 May we introduce Joe beside the sweet 1994 Chevrolet Camaro he purchased from us at White's Auto Sales in Rensselaer, IN. 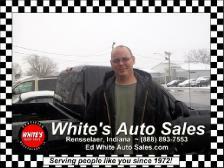 We present Tim with the 2006 Dodge Dakota he purchased from us here at White's Auto Sales in Rensselaer, Indiana. 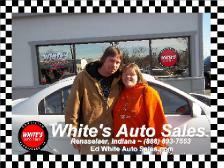 May we introduce Johnathan & Emily with the 2005 dodge Neon they purchased from us at White's Auto Sales in Rensselaer, IN. 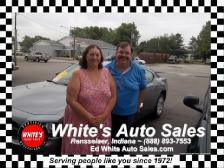 We would like to introduce Bonnie & William with the 2007 Dodge Charger they purchased from us at White's Auto Sales in Rensselaer, Indiana. 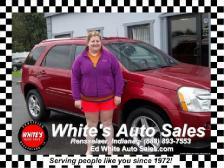 May we introduce Tiffany with the 2006 Chevrolet Equinox she purchased from us at White's Auto Sales in Rensselaer, IN. 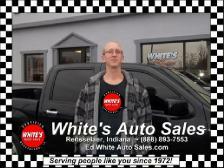 Let us introduce Chris with his 2006 Dodge Dakota that he bought from us at White's Auto Sales in Rensselaer, Indiana. 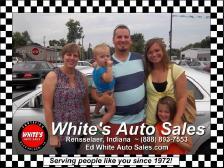 May we introduce you to John and his family with the 2011 Ford Focus he purchased for them from us at White's Auto Sales in Rensselaer, Indiana. 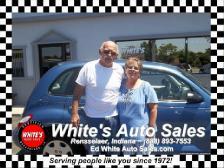 We would like to introduce Michael & Deborah with the 2006 Chrysler PT Cruiser they purchased from us at White's Auto Sales in Rensselaer, IN. 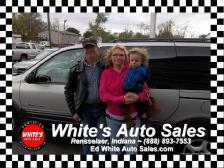 May we present Susan and Robert with the 2003 Buick Rendezvous they just purchased from us at White's Auto Sales in Rensselaer, IN. 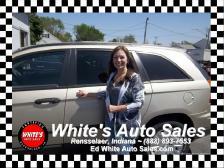 We proudly introduce Michelle with the 2005 Chrysler Pacifica she purchased from us at White's Auto Sales in Rensselaer, IN. 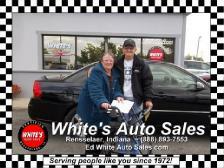 May we present Janet and Don with the 2009 Chevrolet Impala they purchased from us at White's Auto Sales in Rensselaer, Indiana. 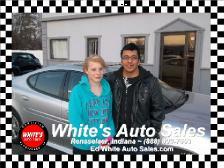 May we introduce Krista and Robert with the 2005 Pontiac Bonneville they purchased from us at White's Auto Sales in Rensselaer, IN. 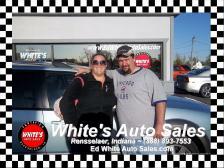 May we introduce Mike with the 2005 Kia Sedona he purchased for his family from us here at White's Auto Sales in Rensselaer, Indiana. 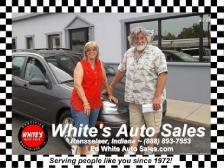 May we introduce Tracy with the 2003 Saturn L-200 she purchased from us at White's Auto Sales in Rensselaer, IN. 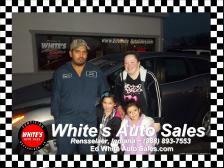 May we introduce Joel, Diana & family in front of the 2002 Honda Civic they purchased from White's Auto Sales in Rensselaer, Indiana. 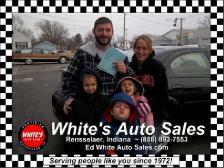 May we introduce john and his family, as they finish taking delivery of the 2002 Chrysler PT Cruiser he just purchased from us at White's Auto Sales in Rensselaer, IN. 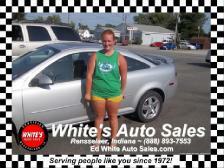 May we introduce Brenna with the 2005 Chevrolet Cobalt she purchased from us at White's Auto Sales in Rensselaer, Indiana. 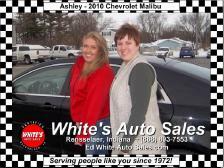 May we introduce Shelly and a friend beside the 2006 Chevrolet HHR she purchased from us at White's Auto Sales in Rensselaer, Indiana. 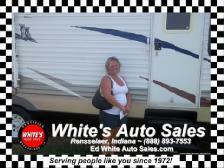 May we introduce Lisa beside the 2008 Palomino Puma camper she purchased from us at White's Auto Sales in Rensselaer, IN. 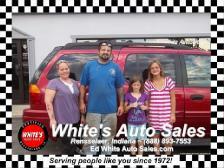 May we introduce Holly, Shane and their family beside the 2004 GMC Envoy they purchased from us at White's Auto Sales in Rensselaer, Indiana. 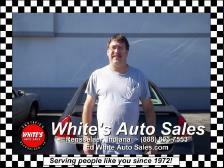 May we introduce Brian with the 2005 Chevrolet Impala he purchased from us at White's Auto Sales in Rensselaer, IN. 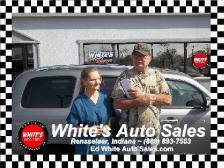 May we introduce Rodger and Debbie with the 2002 Chevrolet Trailblazer they purchased from us at White's Auto Sales in Rensselaer, Indiana. 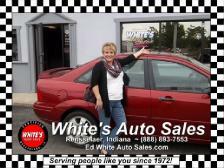 We are pleased to introduce Michelle beside the 2002 Ford Taurus she purchased from us at White's Auto Sales in Rensselaer, Indiana. 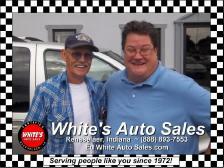 May we introduce Richard with the 2004 Toyota Tacoma he purchased from us at White's Auto Sales in Rensselaer, Indiana. 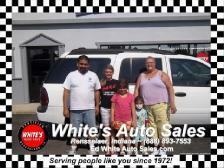 May we introduce Jorge, Mary and their family beside the 2003 Chevrolet Trailblazer they purchased from us at White's Auto Sales in Rensselaer, Indiana. 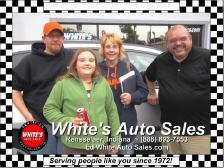 May we introduce Melanie with her father and daughter, joined by Ed and Troy, beside the 2002 Saturn LS-L300 she just purchased from us at White's Auto Sales in Rensselaer, IN. 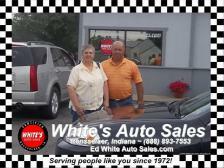 May we introduce Glenn and Linda beside the 2001 Lincoln Town Car they purchased from us today at White's Auto Sales in Rensselaer, Indiana. 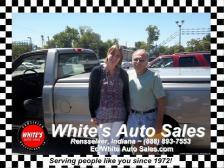 May we introduce Theleen and Duane with the 2010 Ford Ranger the purchased from us at White's Auto Sales in Rensselaer, IN. 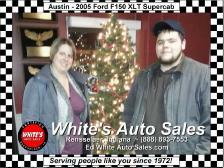 May we introduce Glenn Kreuger (owner of Kreuger Chistmas Tree Farm-the best trees in the area) with our very own Taryn White, beside the Mercedes Benz E320 he purchased from us at White's Auto Sales in Rensselaer, Indiana. We are pleased to introduce a few members of Faith Pentecostal Church in Rensselaer beside the 2004 Ford F350 passenger van they purchased from us at White's Auto Sales in Rensselaer, Indiana. 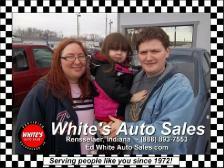 May we introduce Laura, Chris and their daughter with the 2002 Pontiac Montana the purchased from us at White's Auto Sales in Rensselaer, IN. 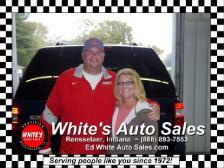 May we introduce Dale and our own Taryn, beside the 2008 Ford Edge Dale just purchased from us at White's Auto Sales in Rensselaer, Indiana. 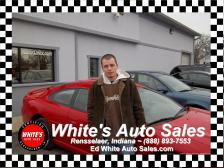 May we introduce Bryan with the 2003 Ford Mustang he purchased from us at White's Auto Sales in Rensselaer, Indiana. 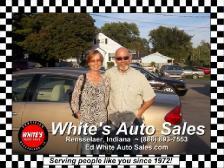 May we present Glenn & Linda with the 2001 Lincoln Town Ca they purchased from us at White's Auto Sales in Rensselaer, Indiana. May we introduce Jason & his father, Dave, beside the 1999 Buick Century Jason purchased from us at White's Auto Sales in Rensselaer, Indiana. 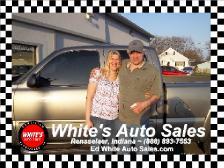 May we introduce Garry (standing beside our very own Taryn) and the 2003 Chevrolet Silverado he purchased from us at White's Auto Sales in Rensselaer, IN. 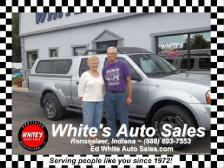 May we introduce Kent and Sue with the 2010 Ford Ranger they purchased from us at White's Auto Sales in Rensselaer, Indiana. 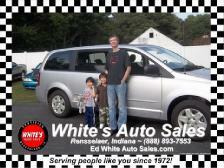 May we introduce Steven & his children beside the 2009 Dodge Grand Caravan he purchased from us at White's Auto Sales in Rensselaer, Indiana. 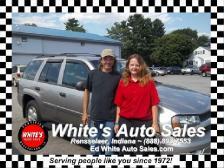 May we introduce Debbie & Tim with the 2004 Ford Focus Wagon wagon they purchased from us at White's Auto Sales in Rensselaer, Indiana. 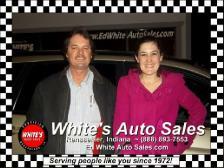 May we introduce Marion and a fiend with the 2006 Chrysler Town & Country they purchased from us at White's Auto Sales in Rensselaer, Indiana. 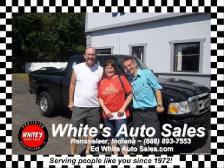 May we introduce Carol and Dan with the 2003 Nissan Frontier they purchased from us at White's Auto Sales in Rensselaer, IN. 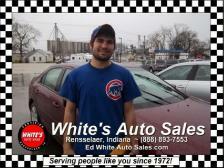 May we introduce Luis with the 2003 Ford Focus SVT he purchased from us at White's Auto Sales in Rensselaer, Indiana. 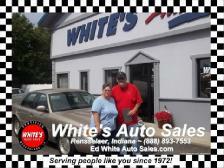 May we present Laurie and Mark with the 2000 Mercury Grand Marquis they purchased from us at White's Auto Sales in Rensselaer, Indiana. 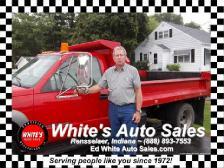 May we present Ed Bessinger, president of C & E Excavating in Elkhart, Indiana with the 2000 Chevrolet C3500 HD Dump Truck he purchased for his company from us at White's Auto Sales in Rensselaer, IN. 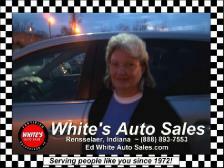 May we introduce Robin beside the 2005 Chevrolet Equinox she purchased from us at White's Auto Sales in Rensselaer, Indiana. 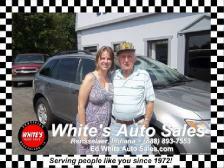 May we introduce Tim and his wife as he takes delivery of the 2005 Buick Rendezvous he just purchased from us at White's Auto Sales in Rensselaer, Indiana. 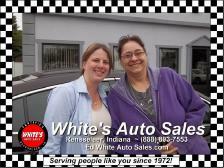 May we introduce Theresa and Jeanna with the 2004 Kia Optima they purchased from us at White's Auto Sales in Rensselaer, IN. 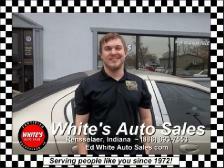 May we introduce Forrest in front of the 2008 Chevrolet Impala he purchased from us here at White's Auto Sales in Rensselaer, Indiana. 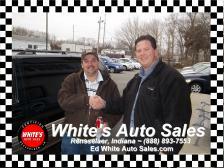 May we introduce Chris and his friend Memory with the 2009 Chrysler Town & Country he purchased from us here at White's Auto Sales in Rensselaer, IN. 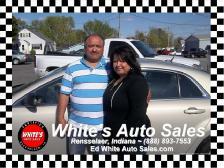 May we present Jose & Jovita with the 2004 Dodge Neon they purchased from us at White's Auto Sales in Rensselaer, Indiana. 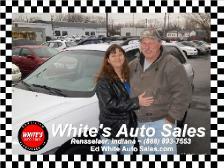 May we introduce Larry & Debbie with the 2005 Ford Focus they puchased from us here at White's Auto Sales in Rensselaer, Indiana. 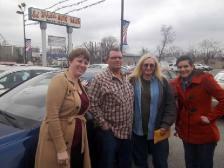 ... Dennis really came here to pick up the 2010 Toyota Prius II he won from our auction on eBay. 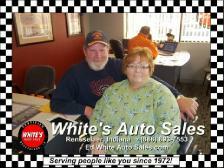 Another day in the life of White's Auto Sales in Rensselaer, IN! 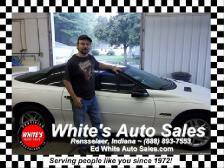 May we introduce Matt with the 2003 Pontiac Grand Prix he purchased from us here at White's Auto Sales in Rensselaer, Indiana. May we introduce a driver from JB Equipment in Morocco, Indiana with the Ford F-150 his boss just purchased from us at White's Auto Sales in Rensselaer, IN. 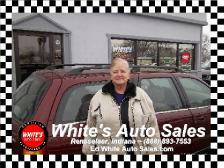 May we introduce Dorothy with the 2003 Buick Rendezvous she purchased from us here at White's Auto Sales in Rensselaer, Indiana. 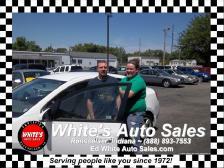 May we introduce Tanny & John with the 2008 Nissan Versa they purchased from us here at White's Auto Sales in Rensselaer, IN. May we introduce Tim and Tim. 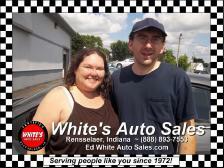 They just purchased a cool 2002 Chevrolet Monte Carlo from us here at White's Auto Sales in Rensselaer, Indiana. 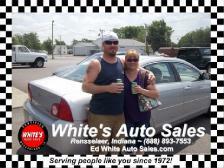 May we introduce Evan with the 2005 Chevrolet Monte Carlo he purchased from us here at White's Auto Sales in Rensselaer, IN. 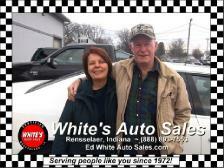 May we present Aga & Ronnie with Troy, beside the 2005 Dodge Stratus they drove down from Chicago to purchase from us here at White's Auto Sales in Rensselaer, Indiana. 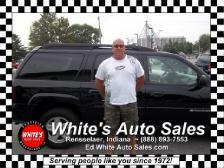 May we introduce Jim with the 2003 Chevrolet Trailblazer he purchased from us here at White's Auto Sales in Rensselaer, IN. We celebrate with Ashley today! She came in and made he LAST PAYMENT! Way to go Ashley. 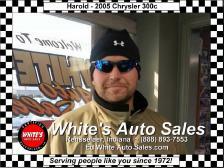 When you are ready for another car, White's will be here for you. 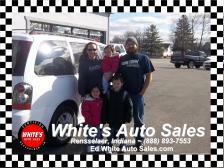 May we introduce Martha, Juan and the family beside the 2006 Ford Freestar they purchased from us here at White's Auto Sales in Rensselaer, IN. 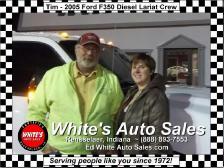 May we introduce Tom with the 2002 Ford F150 4WD he just purchased from us here at White's Auto Sales in Rensselaer, Indiana. 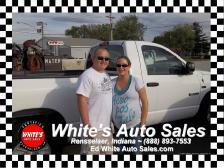 May we introduce Connie and Bob with the 2005 Dodge Ram 1500 Crew Cab 4WD they purchased from us at White's Auto Sales in Rensselaer, Indiana. 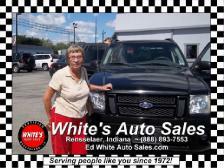 May we introduce Oma with the 2005 Ford Sport Trac she purchased from us at White's Auto Sales in Rensselaer, In. 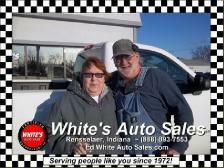 May we introduce Louise with the 2003 Ford Ranger she puchased from us here at White's Auto Sales in Rensselaer, Indiana. 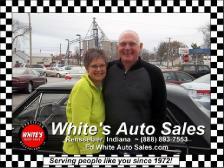 May we introduce Donna and Doug with the 2007 Buick LaCrosse they purchased from us at White's Auto Sales in Rensselaer, IN. 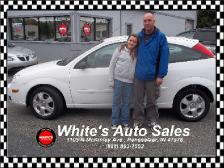 May we introduce Lela with the 2002 Ford Focus she purchased from us at White's Auto Sales in Rensselaer, IN. 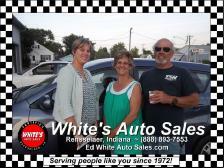 We are pleased to introduce Nancy and James with the 2012 Ford Focus they purchased from us at White's Auto Sales in Rensselaer, Ind. 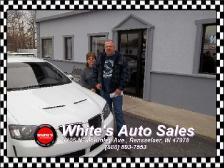 May we introduce Andrew and Carson who just purchased a 2005 Pontiac Grand Prix GTP from us here at White's Auto Sales in Rensselaer, Indiana. 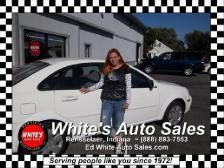 May we introduce Michelle with the 2007 Suzuki Forenza she purchased from is at White's Auto Sales in Rensselaer, IN. 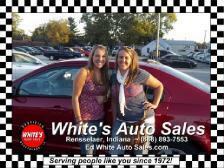 May we introduce Chelsea and her friend beside the 2008 Ford Fusion she purchased from us here at White's Auto Sales in Rensselaer, Indiana. 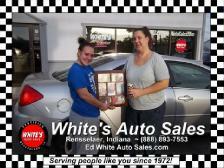 May we introduce Jessika and her mother Melissa with the 2006 Pontiac G6 they purchased from us at White's Auto Sales in Rensselaer, IN. 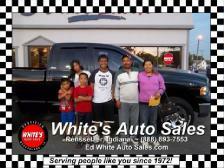 May we introduce Roberto and his family beside the 2002 Dodge Ram 1500 4WD Crew Cab he purchased from us at White's Auto Sales in Rensselaer, IN. 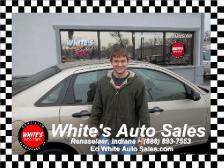 May we introduce Nathan beside the 2004 Ford Taurus he purchased from us at White's Auto Sales in Rensselaer, IN. 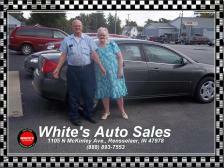 May we introduce Marge and Ron with the 2006 Chevrolet Malibu the purchased from us at White's Auto Sales in Rensselaer, Indiana. 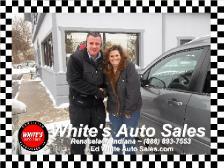 May we introduce Rebecca with the 2003 Pontiac Montana she bought from us at White's Auto Sales in Rensselaer, Indiana. 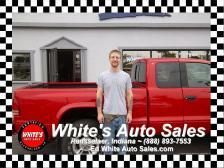 May we introduce Luke with the 2005 Chevrolet Silverado he purchased from us here at White's Auto Sales in Rensselaer, IN. 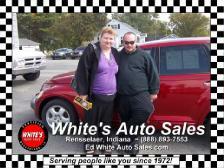 My we introduce Amanda and Brian beside the 2002 Chrysler PT Cruiser they purchased from us at White's Auto Sales in Rensselaer, Indiana. 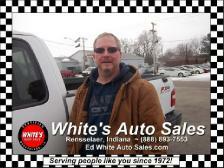 May we introduce Robert with the 2004 Chevrolet Silverado he purchased from us at White's Auto Sales in Rensselaer, IN. 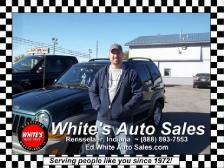 May we introduce Michael with the 2005 Jeep Liberty he purchased from us at White's Auto Sales in Rensselaer, Indiana. 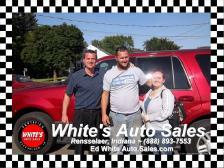 May we introduce Kevin and Trudy with the 2007 Ford Expedition they purchased from us at White's Auto Sales in Rensselaer, IN. 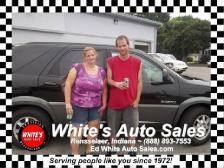 May we introduce Michael and Melissa with the 2008 Dodge Grand Caravan they purchased from us at White's Auto Sales in Rensselaer, Indiana. 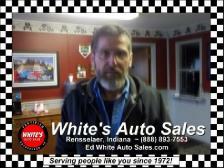 May we introduce Gene with the 1987 Chevrolet Nova he purchased from us at White's Auto Sales in Rensselaer, Indiana. 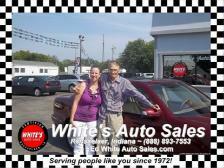 May we introduce Andrea and the 2003 Dodge Neon she purchased from us here at White's Auto Sales in Rensselaer, IN. 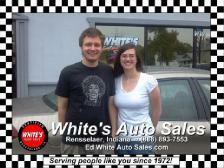 May we introduce Kent and Rachel beside the 2005 Ford Focus they purchased from us at White's Auto Sales in Rensselaer, Indiana. 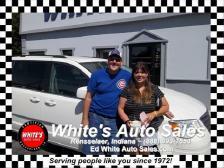 May we introduce Mr. & Mrs. DeWeese with the 2007 Chrysler Town and Country they purchased from us at White's Auto Sales in Rensselaer, Indiana. 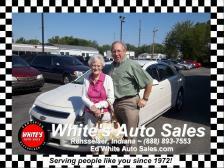 May we introduce Vicki and Michael with the 2011 Chevrolet Malibu they purchased from us at White's Auto Sales in Rensselaer, IN. 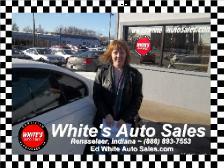 We are pleased to introduce Ann and Gary with the 2004 Mercedes Benz CLK500 they purchased from us at White's Auto Sales in Rensselaer, Indiana. 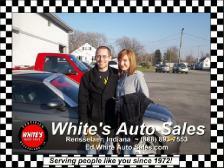 May we introduce Chris and Diana beside the 2004 Chrysler Crossfire he purchased from us at White's Auto Sales in Rensselaer, IN. 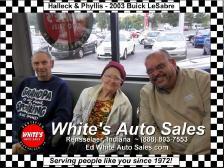 May we introduce Betty and Marvin with the 2007 Buick Lucerne they purchased from us at White's Auto Sales in Rensselaer, Indiana. 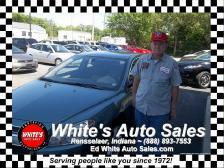 May we introduce Terry with the 2005 Saturn Ion he purchased from us at White's Auto Sales in Rensselaer, IN. 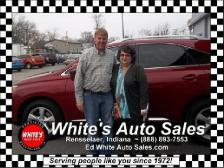 May we introduce Nancy beside the 2010 Lexus RX350 she purchased from us here at White's Auto Sales in Rensselaer, IN. 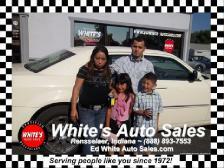 May we introduce Noe and a friend with the 2003 Volkswagen Jetta he purchased from us at White's Auto Sales in Rensselaer, Indiana. 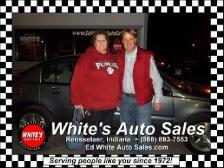 May we introduce Jana with Troy White beside the 2006 Saturn Ion she purchased from us at White's Auto Sales in Rensselaer, IN. 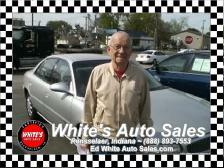 May we introduce Robert with the 2001 Chrysler Sebring he purchased from us at White's Auto Sales in Rensselaer, IN.  We would like to tell you who this is but he is shy. 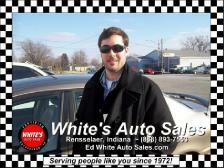 But here is the picture of him in the 2005 Kia Optima he purchased from us at White's Auto Sales in Rensselaer, Indiana. 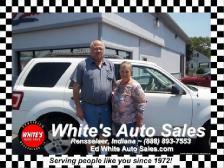 May we introduce Daniel and Susan with the stunning 2003 Ford Expedition Eddie Bauer Edition they purchased from us at White's Auto Sales in Rensselaer, IN. 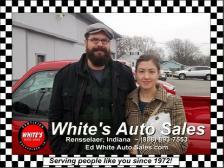 May wein introduce Jeremy and Katie beside the 2003 Ford Ranger XLT they purchased from us at White's Auto Sales in Rensselaer, Indiana. 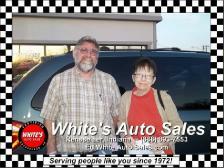 May we introduce Judy with the 2005 GMC Envoy XL she purchased from us at White's Auto Sales in Rensselaer, IN. 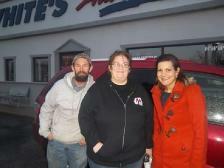 May we introduce Robin, the proud owner of a 1999 Chevrolet Lumina that she purchased from us here at White's Auto Sales in Rensselaer, Indiana. 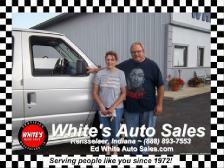 May we introduce Christie and Eric as they take delivery of the 2008 Ford E350 11 passenger van they purchased from us at White's Auto Sales in Rensselaer, IN. 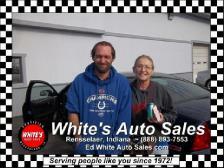 May we introduce Helen and Stephen with the 2007 Buick Lucerne they purchased from us at White's Auto Sales in Rensselaer, IN. 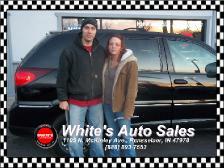 We proudly introduce Kent and Rachel beside the 2004 Chrysler Pacifica they purchased from us at White's Auto Sales in Rensselaer, IN. 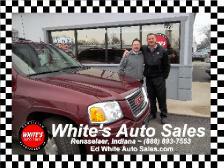 May we introduce Kelly and Rene'with the 2006 GMC Yukon they purchased from us at White's Auto Sales in Rensselaer, IN. 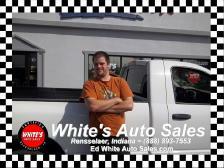 May we introduce Nick with the 2009 Chevrolet Colorado Crew Cab he purchased from us at White's Auto Sales in Rensselaer, IN. 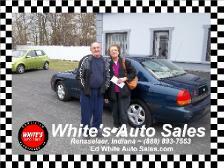 May we introduce Cleo and Tiffany with the 2005 Chevrolet Cobalt they purchased from us at White's Auto Sales in Rensselaer, IN. 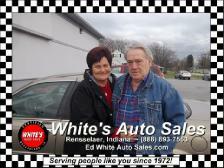 May we introduce Barbara and Nelson with the 2003 Mercury Grand Marquis they purchased from us at White's Auto Sales in Rensselaer, Indiana. 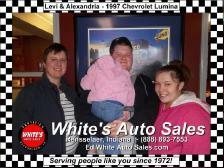 May we introduce Alyssa in the 2003 Chevrolet Caviler she purchased from us at White's Auto Sales in Rensselaer, Indiana. 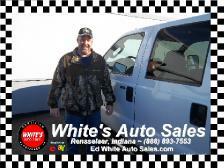 We are proud to introduce Jack with the 2006 Chevrolet Silverado 1500 Work Truck he purchased from us here at White's Auto Sales in Rensselaer, Indiana. 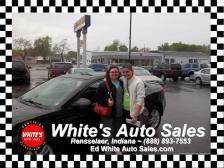 May we introduce Abby and her fiancee Shannon with the 2011 Kia Optima she purchased from us at White's Auto Sales in Rensselaer, IN. 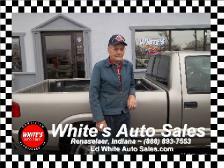 May we introduce Denny with the 2005 Ford F-150 4WD FX4 Flareside pickup he purchased from us at White's Auto Sales in Rensselaer, Indiana. 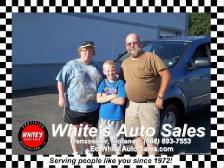 May we introduce Christie and Donnie with their son beside the 2004 Ford F150 they purchased from us at White's Auto Sales in Rensselaer, Indiana. 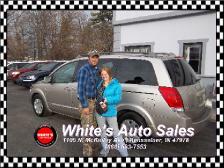 May we introduce Jessica and Vince with the 2004 Chrysler Pacifica AWD thay purchased from us here at White's Auto Sales in Rensselaer, Indiana. 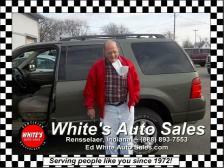 May we introduce Richard beside the 2004 Ford Explorer NBX he purchased from us at White's Auto Sales in Rensselaer, IN 47978. 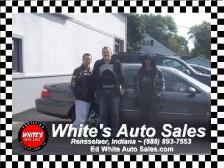 May we introduce John with the 2005 Chrysler Town & Country he purchased from us at White's Auto Sales in Rensselaer, IN. 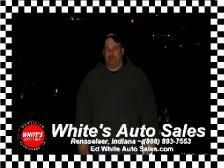 We are proud to introduce Curtis with the 2005 Chevrolet Impala he purchased from us at White's Auto Sales in Rensselaer, Indiana. 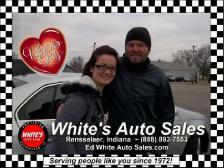 We are happy to introduce our Valentines Day 2013 couple Ashley and James beside the 2007 Volkswagen Jetta Wolfsburg Edition they purchased from us today at White's Auto Sales in Rensselaer, IN. 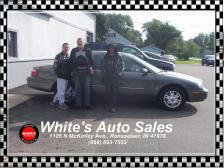 May we introduce Jack with the 2007 Mercury Grand Marquis he purchased from us at White's Auto Sales in Rensselaer, Indiana. 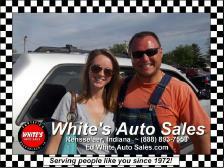 May we introduce Jason and Brandi with the 2007 Buick Rendezvous they purchased from us at White's Auto Sales in Rensselaer, IN. 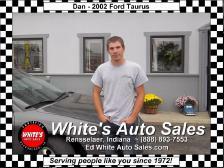 May we introduce Dan with the 2005 Ford Taurus he purchased from us at White's Auto Sales in Rensselaer, Indiana. 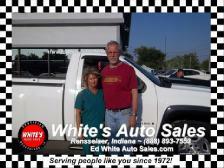 May we introduce Jerry and his wife in the 2004 Chevrolet 2500 HD pickup they purchased from us at White's Auto Sales in Rensselaer, Indiana. 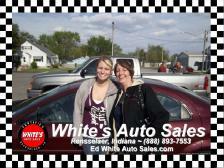 May we introduce Kimberly with the 2011 Ford Focus she purchased from here at White's Auto Sales in Rensselaer, IN. 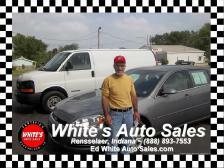 May we introduce Tom and Tom with the 2002 Chevrolet Cavalier they purchased from us at White's Auto Sales in Rensselaer, Indiana. 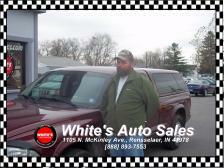 May we introduce Brian beside the 2003 Ford Expedition he purchased from us at White's Auto Sales in Rensselaer, Indiana. 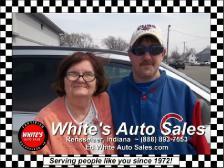 May we introduce Terry and Kathy beside the 2006 Buick Terraza AWD they purchased from us at White's Auto Sales in Rensselaer, Indiana. 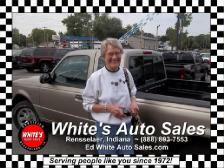 May we introduce Susan with the 2006 Mercury Mariner she purchased from us at White's Auto Sales in Rensselaer, IN. 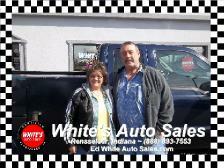 We would like to introduce Donna and Leonard beside the 2004 Silverado Z71 that they purchased from us at White's Auto Sales in Rensselaer, IN. 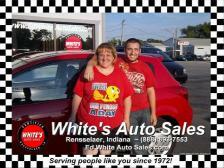 May we introduce Rose and her son Aaron beside the lovely 2008 Hyundai Accent she purchased from us at White's Auto Sales in Rensselaer, IN. 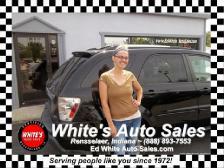 May we introduce Brittany with the 2007 Chrysler Pacifica she purchased from us at White's Auto Sales in Rensselaer, Indiana. 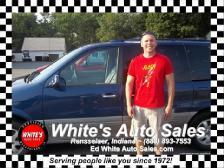 We are proud to introduce Eric with the 2003 Dodge Grand Caravan he purchased from us here at White's Auto Sales in Rensselaer, Indiana. 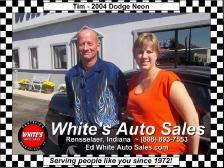 May we introduce Dwayne and Kelly with the with the 2004 Dodge Stratus SXT they purchased from us at White's Auto Sales in Rensselaer, IN. 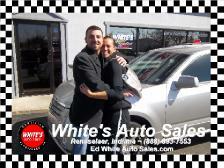 We are very proud to introduce Kirsten with her dream car, the 2010 Chevrolet HHR she purchased from us at White's Auto Sales in Rensselaer, Indiana. 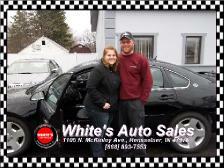 May we introduce Jessica and Steven along with the rest of the family beside the stunning 2012 Chevrolet Impala we sold them at White's Auto Sales in Rensselaer, IN. 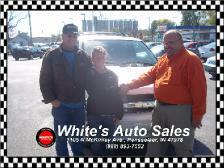 May we introduce Daniell, Ron and their son as they stopped in to take delivery of the 2005 Chevrolet the purchased from us at White's Auto Sales in Rensselaer, IN. 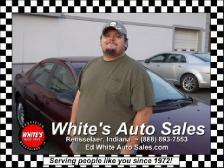 We take pride in introducing Rich with the 2005 Dodge Neon SXT he purchased from us at White's Auto Sales in Rensselaer, Indiana. 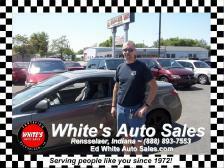 May we introduce Thomas, here to pick up the 2007 Honda Civic Si he purchased from us at White's Auto Sales in Rensselaer, IN. 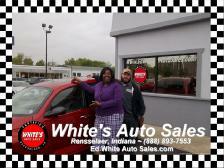 We are happy to introduce Christine and David with the 2011 Nissan Versa they purchased from us at White's Auto Sale in Rensselaer, IN. 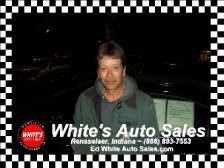 May we introduce Dennis just after he purchased a 2004 Mini Cooper from us here at White's Auto Sales in Rensselaer, Indiana. 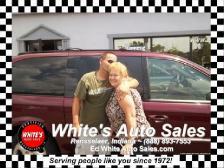 May we introduce Mike and Gwen with the 2005 Chrysler Town & Country they purchased from us at White's Auto Sales in Rensselaer, IN. 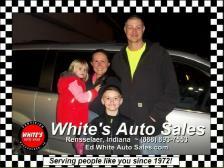 We are overjoyed to introduce Riann, Ryan and the family with the 2008 Chrysler Town & Country the purchased from us at White's Auto Sales in Rensselaer, Indiana. 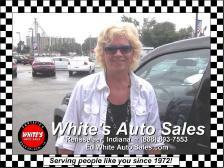 May we introduce Tammy beside the 2008 Saturn Vue she purchased from us at White's Auto Sales in Rensselaer, IN. 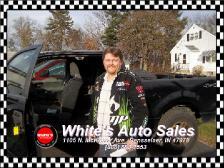 May we introduce "Animal" with the 2006 Ford Ranger SXT he purchased from us at White's Auto Sales in Rensselaer, Indiana. 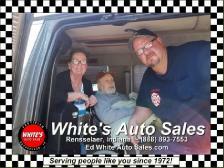 May we introduce Diane, Bob and their son inside the 2004 Ford E250 wheelchair accessible van they purchased from us at White's Auto Sales in Rensselaer, Indiana. 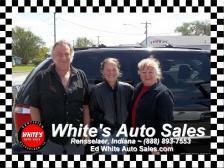 May we introduce Jimmy and Colleen (with Ed in the middle) when they came to pick up the 2003 Jeep Grand Cherokee Laredo they purchased from us at White's Auto Sales in Rensselaer, IN. 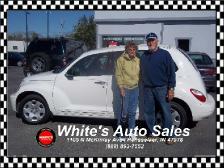 May we introduce Bud, Quentin and Lois with the 2006 Chrysler PT Cruiser that Bud and Lois bought for their grandson from us at White's Auto Sales in Rensselaer, IN. 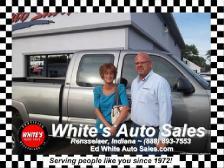 May we introduce Roberta and Mike beside the 2012 Chevrolet Silverado 1500 4WD thay purchased from us at White's Auto Sales in Rensselaer, Indiana. 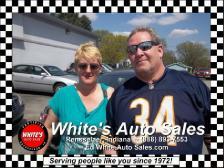 May we introduce Tom and Lonnie with the 2004 Chevrolet Monte Carlo LS Lonnie just purchased from us at White's Auto Sales in Rensselaer, IN. 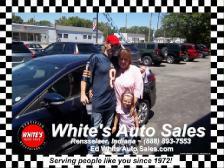 May we introduce Amanda, Jeff and their family with the 2006 Pontiac G6 GTP they purchased from us at White's Auto Sales in Rensselaer, Indiana. 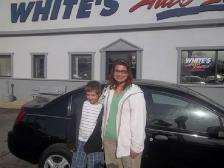 May we introduce Dawn and her son with the 1998 Toyota Camry she purchased from us at White's Auto Sales in Rensselaer, Indiana. 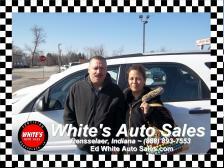 May we introduce Elizabeth, with Ed, beside the 2005 Chrysler Town & Country she purchased from us at White's Auto Sales in Rensselaer, IN. 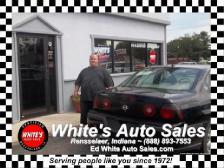 May we introduce Peter with the stunning 2003 Chevrolet Monte Carlo SS he purchased from us at White's Auto Sales in Rensselaer, IN. 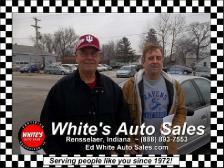 May we introduce Don with Ed beside the 2009 Ford Focus he purchased from us at White's Auto Sales in Rensselaer, IN. 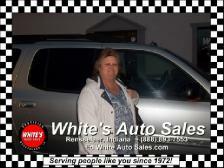 May we introduce Terra with the 2006 Dodge Grand Caravan she purchased from us at White's Auto Sales in Rensselaer, Indiana. 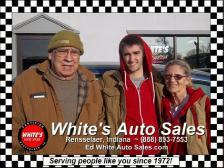 May we introduce Donna, John and their grandson with the 2011 Chevrolet Malibu they purchased from us at White's Auto Sales in Rensselaer, Indiana. 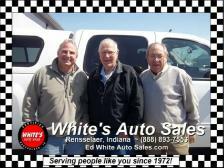 May we introduce Brett and Leon with Ed beside the 2012 Chevrolet Silverado 2500 they just purchased from us at White's Auto Sales in Rensselaer, IN. 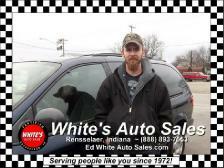 May we introduce Jason beside the 2003 Chrysler PT Cruiser he purchased from us at White's Auto Sales in Rensselaer, Indiana. 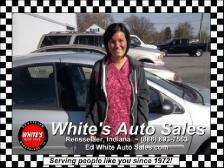 May we introduce Rebecca with the 2008 Chevrolet Aveo she purchased from us at White's Auto Sales in Rensselaer, IN. 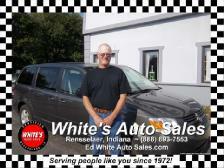 May we introduce Steve with the 2008 Mercury Milan he purchased from us at White's Auto Sales in Rensselaer, Indiana. 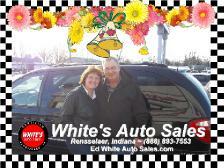 May we introduce Ken and Tammie beside the 2006 Chrysler Pacifica they purchased from us at White's Auto Sales in Rensselaer, IN. 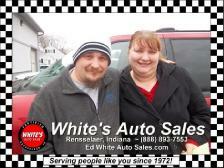 May we introduce Eric and Chrissy with the 2010 Jeep Patriot Latitude they purchased from us at White's Auto Sales in Rensselaer, IN. 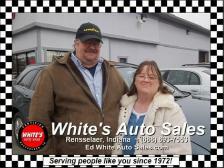 May we introduce Jim with his wife beside the 2009 Saturn VUE they purchased from us at White's Auto Sales in Rensselaer, IN. 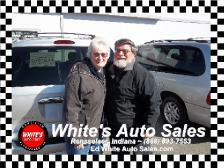 May we introduce Judith and Robert with the 2006 Chrysler Pacifica they purchased from us at White's Auto Sales in Rensselaer, Indiana. 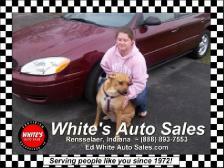 We are pleased to introduce Anna with her puppy, Lily, beside the 2007 Ford Taurus SE she purchased from us at White's Auto Sales in Rensselaer, IN. 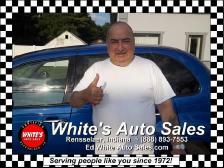 We are honored to introduce Dennis, a 9 year veteran of the United States Army now working at Purdue, beside the 2002 Dodge Neon he purchased from us at White's Auto Sales in Rensselaer, Indiana. It is an honor to serve you as you have served us. 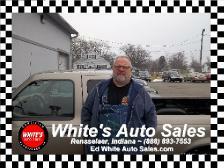 May we introduce Jim with the 2005 Ford F150 Crew Cab he purchased from us at White's Auto Sales in Rensselaer, Indiana. 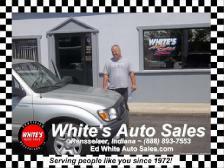 May we introduce Dave in front of the 2003 Ford Escape Limited he purchased from us at White's Auto Sales in Rensselaer, Indiana. 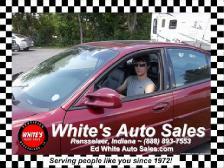 May we introduce Shane with the stunning 2008 Ford Fusion he purchased from us at White's Auto Sales in Rensselaer, Indiana. 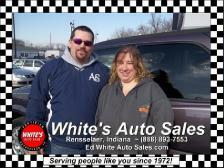 May we introduce Joe and Jenny beside the 2007 Chrysler Town & Country W.P. 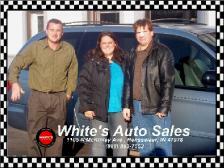 Chrysler Signature Edition van that they purchased from us at White's Auto Sales in Rensselaer, IN. 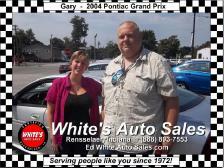 May we introduce Carl and Clarice with the 2005 Pontiac Grand Prix GTP they purchased from us at White's Auto Sales in Rensselaer, IN. 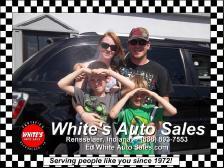 May we introduce Billie, Todd and thier family beside the 2008 Ford Escape Hybrid they purchased from us at White's Auto Sales in Rensselaer, IN. 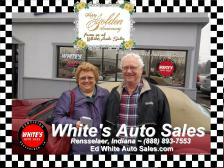 We are tickled to introduce Deborah and Michael beside the 2007 Mini Cooper S convertible they purchased from us at White's Auto Sales in Rensselaer, Indiana. 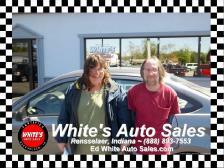 May we introduce Diana and Bud in front of the 2012 Mazda 6 iTouring they just purchased from us at White's Auto Sales in Rensselaer, Indiana. 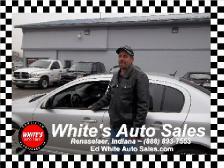 May we introduce Todd with the 2010 Ford Fusion he purchased from us at White's Auto Sales in Rensselaer, Indiana. 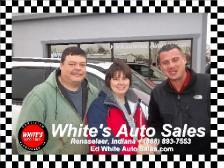 May we introduce Angeline and Victor with Ed beside the 2012 Jeep Liberty Sport 2WD they just purchased from us at White's Auto Sales in Rensselaer, IN. 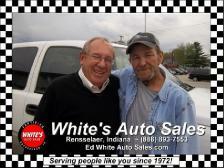 May we introduce Tom with Ed and the 2005 Chevrolet Silverado 1500 he purchased from us at White's Auto Sales in Rensselaer, IN. 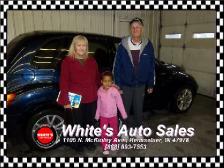 We are pleased to introduce Jeniffer and Tim beside the 2011 Chevrolet Cruze they purchased from us at White's Auto Sales in Rensselaer, IN. 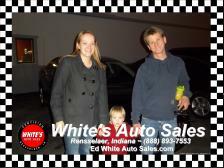 We are really happy to introduce Cavin and his father Jeff with with Cavin's mother and fiancee, next to the 2005 Mini Cooper S they purchased from us at White's Auto Sales in Rensselaer, IN. 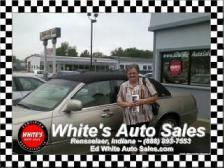 May we introduce Tara beside the stunning 2005 Chrysler Sebring sh purchased from us at White's Auto Sales in Rensselaer, Indiana. 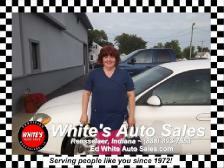 May we introduce Tara beside the 2005 Chrysler Sebring she purchased from us at White's Auto Sales in Rensselaer, Indiana. 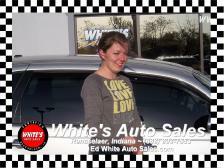 May we introduce Mindy beside the 2006 Kia Amanti she just purchased from us at White's Auto Sales in Rensselaer, IN. 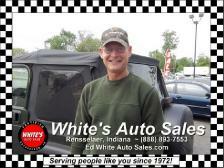 May we introduce Phil beside the 1997 Jeep Wrangler he purchased from us at White's Auto Sales in Rensselaer, Indiana. 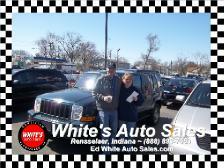 May we introduce Larry and Angelica beside the 2005 Jeep Liberty they just purchased from us at White's Auto Sales in Rensselaer, IN. 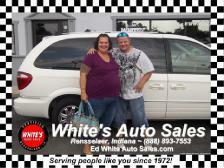 May we introduce Brian and Dawn with the great 1998 Buick Roadmaster they just purchased from us at White's Auto Sales in Rensselaer, IN. 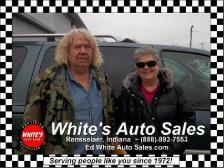 We are proud to introduce Frank and his wife beside the 2006 Jeep Grand Cherokee he just bought for her from us at White's Auto Sales in Rensselaer, IN. 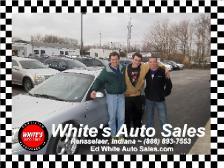 May we introduce Nathan and Robert beside the 2012 Chrysler 200 tey just purchased from us at White's Auto Sales in Rensselaer, IN. 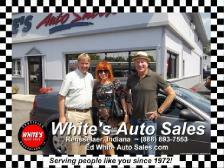 May we introduce Elise in front of the lovely 2008 Chevrolet HHR she just purchased from us at White's Auto Sales in Rensselaer, Indiana. 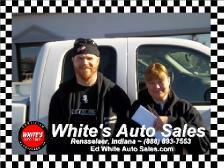 May we introduce Nathan Ziese, son of Dave Ziese / Ziese Plumbing & Heating, beside the 2006 Chevrolet Colorado he purchased from us at White's Auto Sales in Rensselaer, IN. 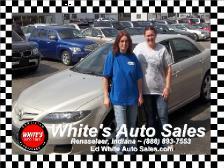 May we introduce Taryn White with her first customer, Christine beside the 2010 Mazda 6 she just bought from Taryn at White's Auto Sales in Rensselaer, IN. 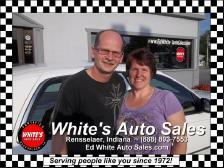 May we introduce Ron and Yvonne beside the 2006 Mercury Grand Marquis LS Ultimate they just purchased from us at White's Auto Sales in Rensselaer, IN. 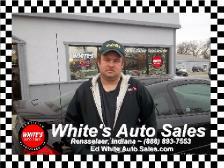 May we introduce Brian with the 2008 Chevrolet Impala he purchased from us at White's Auto Sales in Rensselaer, IN. 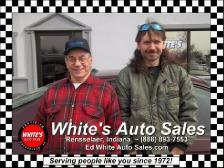 May we introduce Adrian and Tom beside the 2009 Chevrolet HHR they just purchased from us at White's Auto Sales in Rensselaer, IN during our Annual Anniversary Sale, going on now through June 30th! 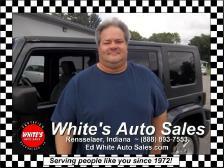 May we introduce John with the 2007 Jeep Wrangler Sahara Unlimited he purchased from us at White's Auto Sales in Rensselaer, IN during our annual Anniversary Sale, going on Now through June 30th. 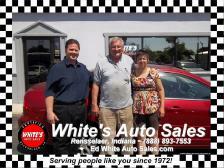 May we introduce Karen and her father who drove down from Hammond for a great deal on a 2012 Ford Fusion from us at White's Auto Sales in Rensselaer, Indiana during our Anniversary Sale - going on now through June 30th! May we introduce Tahir, Irfan and more of their family who drove here from Virginia for this stunning 2009 Lincoln Town Car Signature L from White's Auto Sales in Rensselaer, Indiana. 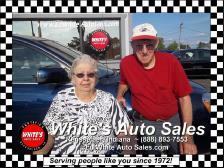 May we introduce Lillian and Ken beside the 2010 Pontiac Vibe they purchased from us at White's Auto Sales in Rensselaer, IN during our 41st Anniversary Sale going on through June 30th. 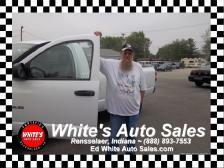 May we introduce Forrest beside the 2010 GMC Sierra he just purchased from us at White's Auto Sales in Rensselaer, Indiana during our Anniversary celebration going on through June 30th! 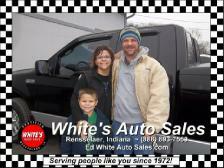 May we introduce Dan, Tara and their family, with the 2006 Ford F-150 Crew Cab they just purchased from us at White's Auto Sales in Rensselaer, Indiana during our Anniversary Celebration going on through June 30th. 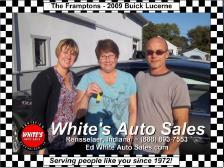 May we introduce Nancy with the 2008 Buick Lucerne CXL she just purchased from us at White's Auto Sales in Rensselaer, IN during our Anniversary Celebration going on now through June 30th! 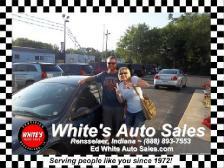 May we introduce Jodie and Brian with the 2006 Pontiac G6 the just purchased from us at White's Auto Sales in Rensselaer, IN during our Anniversary Celebration going on now through June 30th! Get in here soon! 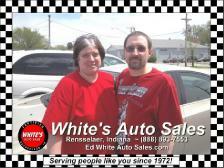 May we introduce Mary and Ed beside the 2006 Ford Five Hundred AWD they just purchased from us at White's Auto Sales in Rensselaer, IN during our Anniversary Celebration going on now through June 30th. Get in quick and you may win $20,000! 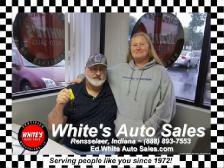 May we introduce Lolly and Bill with the 2007 Jeep Liberty they just purchased from us at White's Auto Sales in Rensselaer, IN during our Anniversary Celebration going on now through June 30th! 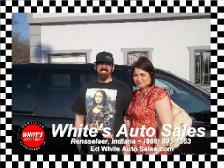 May we introduce Anita and William with the 2006 Dodge Grand Caravan they just purchased from us at White's Auto Sales in Rensselaer during our Anniversary Celebration going on now through June 30th! 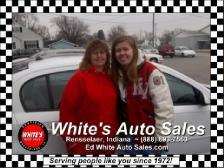 May we introduce Julie and her daughter beside the 2010 Chevrolet Cobalt she purchased from us at White's Auto Sales in Rensselaer, Indiana during our Anniversary Celebration going on now through June 30th! 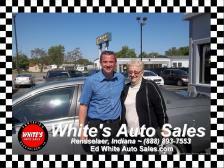 May we introduce Tom and Stephanie with the 2005 Hyundai Sonata they just purchased from us at White's Auto Sales in Rensselaer, IN during our Anniversary Celebration going on now through June 30th! 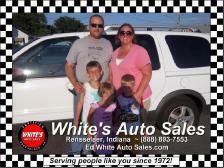 May we introduce Shawn and Jennifer with their family beside the 2005 Pontiac Montana they just purchased from us at White's Auto Sales in Rensselaer, IN during our Anniversary Celebration going on now through June 30th! 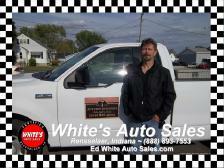 May we introduce Dean beside the 2005 Dodge Ram 3500 Crew Cab diesel he purchased from us at White's Auto Sales in Rensselaer, Indiana. 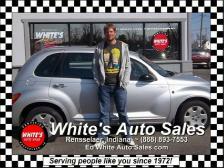 May we introduce Aaron with the 2003 Chrysler PT Cruiser he purchased from us at White's Auto Sales in Rensselaer, IN. 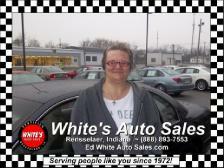 May we introduce Val with the 2011 Nissan Sentra she purchased from us at White's Auto Sales in Rensselaer, Indiana. 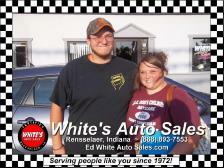 May we introduce Amber and Alex with the 2009 Ford Edge they purchased from us at White's Auto Sales in Rensselaer, Indiana. 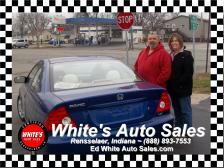 May we introduce James beside the 2007 Saturn Relay he purchased from us at White's Auto Sales in Rensselaer, IN. 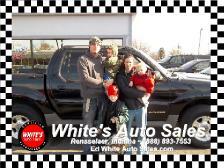 May we introduce Alicia beside the 2006 Nissan Titan NO FEAR Edition truck she purchased from us at White's Auto Sales in Rensselaer, Indiana. 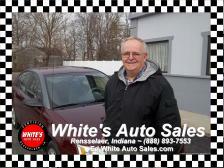 May we introduce Rick with the 2003 Buick Rendezvous he purchased from us at White's Auto Sales in Rensselaer, IN. 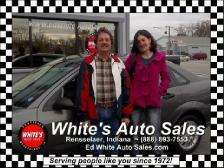 May we introduce Teri with the 2004 Saturn Ion Quad Coupe she purchased from us at White's Auto Sales in Rensselaer, IN. 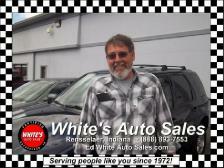 May we introduce Gary beside the 2003 Ford Explorer XLT he purchased from us at White's Auto Sales in Rensselaer, IN. 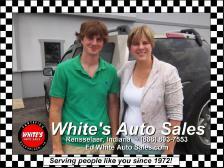 May we introduce Jeremiah with the 2006 Jeep Liberty he purchased from us at White's Auto Sales in Rensselaer, IN. 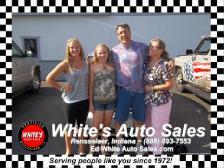 May we introduce Mike and his family with the 2006 Chevrolet Equinox he purchased from us at White's Auto Sales in Rensselaer, IN. 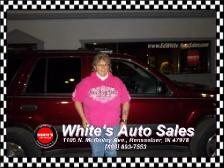 May we introduce Jeniffer beside the 2003 Ford Explorer she purchased from us at White's Auto Sales in Rensselaer, IN. 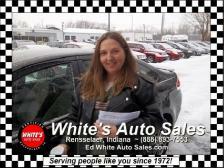 May we introduce Rebecca beside the 2011 Dodge Avenger she purchased from us at White's Auto Sales in Rensselaer, IN. 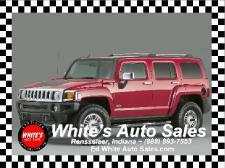 We are happy to introduce Vickie with the 2006 Jeep Liberty she purchased from us at White's Auto Sales in Rensselaer, IN. 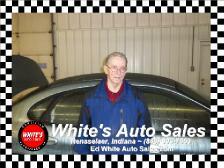 We are happy to introduce James with the 2005 Hyundai Elantra he purchased from us at White's Auto Sales in Rensselaer, Indiana. 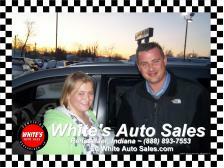 We are pleased to introduce Kayla beside the 2010 Pontiac Vibe she purchased from us at White's Auto Sales in Rensselaer, IN. 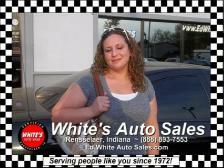 We are pleased to introduce Heather beside the 2010 Nissan Altima 2.5S she purchased from us at White's Auto Sales in Rensselaer, IN. 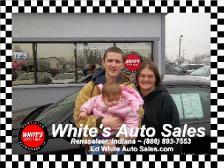 May we introduce Brian and Selena beside the 2010 Chevrolet Malibu they purchased from us at White's Auto Sales in Rensselaer, Indiana. 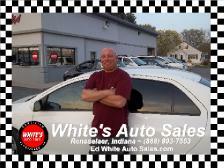 We are very pleased to introduce Keith beside the 2008 Hyundai Accent he purchased from us at White's Auto Sales in Rensselaer, IN. 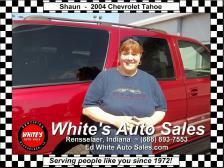 We are very pleased to introduce Shaun beside the 2004 Chevrolet Tahoe she purchased from us at White's Auto Sales in Rensselaer, Indiana. 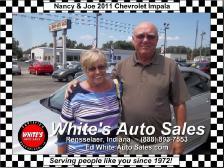 We are very pleased to introduce Nancy & Joe beside the 2011 Chevrolet Impala they purchased from us at White's Auto Sales in Rensselaer, Indiana. 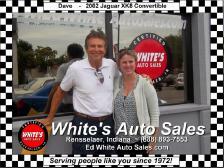 May we introduce Dave Green from Green's Amish Furniture here in Rensselaer as he is taking delivery of the 2002 Jaguar XK8 Convertible he purchased from us at White's Auto Sales in Rensselaer, Indiana. 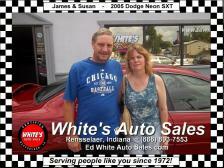 We are very pleased to introduce James and Susan beside the 2005 Dodge Neon SXT they purchased from us at White's Auto Sales in Rensselaer, IN. 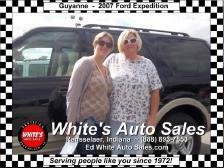 May we introduce Guyanne beside the 2007 Ford Eddie Bauer Expedition she purchased from us at White's Auto Sales in Rensselaer, IN. 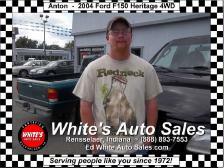 May we introduce Anton beside the 2004 Ford F150 Heritage 4WD pickup he purchased from us at White's Auto Sales in Rensselaer, Indiana. 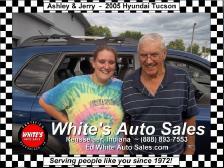 We are very pleased to introduce Ashley with her grandfather Jerry, beside the 2005 Hyundai Tucson he helped her buy from us at White's Auto Sales in Rensselaer, IN. 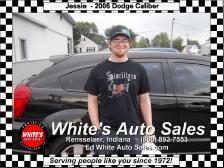 We are very pleased to introduce Jessie beside the 2006 Dodge Caliber he purchased from us at White's Auto Sales in Rensselaer, IN. 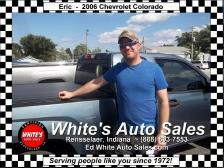 May we introduce Eric beside the 2006 Chevrolet Colorado he purchased from us at White's Auto Sales in Rensselaer, IN. 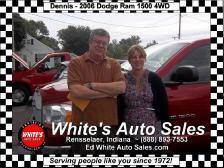 We are pleased to introduce Dennis with the 2006 Dodge Ram 1500 4WD Crew Cab he purchased from us at White's Auto Sales in Rensselaer, Indiana. 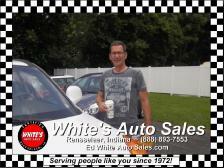 May we introduce Alan beside the 2009 Smart ForTwo he purchased from us at White's Auto Sales in Rensselaer, IN. 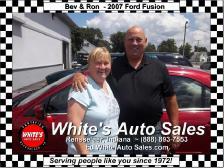 We are very pleased to introduce Bev and Ron beside the 2007 Ford Fusion the purchased from us at White's Auto Sales in Rensselaer, Indiana. 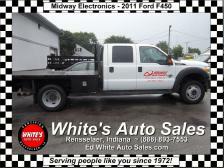 We would like to take this opportunity to thank our friends at Midway Electronics in Rensselaer for their recent purchase of a 2011 Ford F450 Diesel from us at White's Auto Sales in Rensselaer, Indiana. 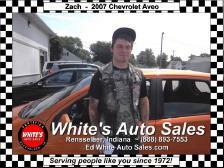 May we introduce Zach beside the 2007 Chevrolet Aveo he purchased from us at White's Auto Sales in Rensselaer, IN. 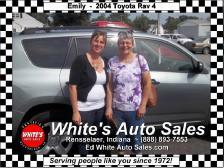 We are very pleased to introduce Emily beside the 2008 Toyota Rav 4 she purchased from us here at White's Auto Sales in Rensselaer, Indiana. 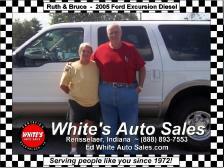 May we introduce Ruth & Bruce beside the 2005 Ford Excursion Excursion Eddie Bauer Diesel they purchased from us at White's Auto Sales in Rensselaer, Indiana. 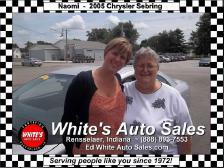 We are very pleased to introduce Naomi beside the stunning 2005 Chrysler Sebring she purchased from us at White's Auto Sales in Rensselaer, IN. 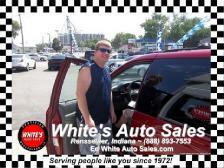 May we take this opportunity to introduce Gavin in front of the 2008 Chevrolet Uplander he purchased from us at White's Auto Sales in Rensselaer, Indiana. 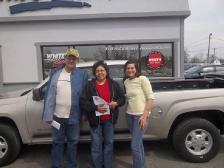 May we introduce Alejandra with a few friends beside the 2007 Honda Ridgeline he purchased from us at White's Auto Sales in Rensselaer, Indiana. 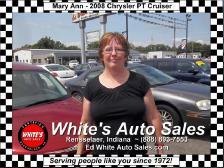 We are very pleased to introduce Mary Ann beside the 2008 Chrysler PT Cruiser she purchased from us at White's Auto Sales in Rensselaer, Indiana. 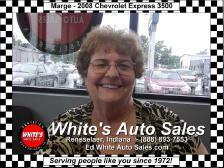 May we introduce Marge from Marge's Upholstery (219-956-3234) in Wheatfield, IN as she is taking delivery of a 2008 Chevrolet Express 3500 van from us at White's Auto Sales in Rensselaer, IN. 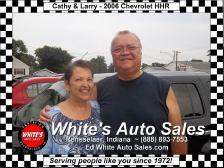 May we introduce Cathy and Larry beside the 2006 Chevrolet HHR they purchased from us at White's Auto Sales in Rensselaer, Indiana. 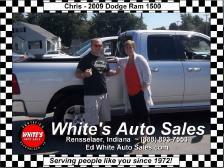 May we introduce Chris beside the 2009 Dodge Ram 1500 he purchased from us at White's Auto Sales in Rensselaer, Indiana. 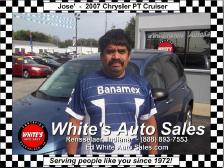 May we introduce Jose beside the 2007 Chrysler PT Cruiser he purchased from us at White's Auto Sales in Rensselaer, IN. 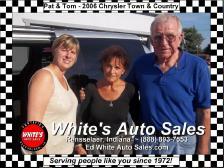 We are very pleased to introduce Pat & Tom beside the 2006 Chrysler Town & Country they traded in Pat's Jeep for at White's Auto Sales in Rensselaer, Indiana. 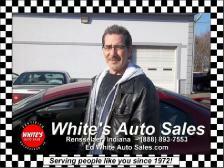 May we introduce Gary beside the 2004 Pontiac Grand Prix he purchased from us at White's Auto Sales in Rensselaer, Indiana. 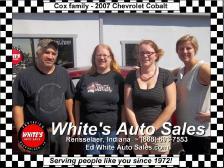 May we introduce the Cox family beside the 2007 Chevrolet Cobalt they took delivery of from us at White's Auto Sales in Rensselaer, IN. 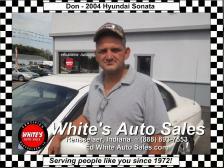 May we introduce Don beside the 2004 Hyundai Sonata he purchased from us at White's Auto Sales in Rensselaer, Indiana. 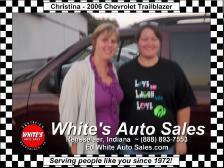 May we introduce Christina beside the 2006 Chevrolet Trailblazer she purchased from us at White's Auto Sales in Rensselaer, Indiana. 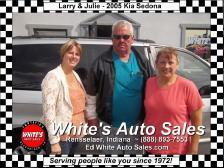 May we introduce Larry and Julie beside the 2005 Kia Sedona they purchased from us at White's Auto Sales in Rensselaer, Indiana. 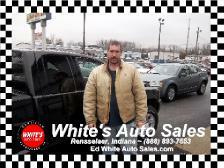 We are very pleased to introduce Bill beside the 2007 Chrysler Town & Country he purchased from us at White's Auto Sales in Rensselaer, IN. 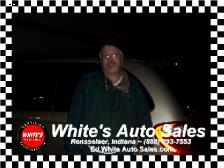 May we introduce Bill in front of the 2007 Chrysler Town and Country he purchased from us at White's Auto Sales in Rensselaer, Indiana. 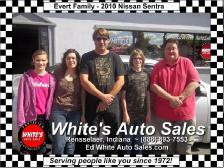 May we introduce the entire Evert Family beside the 2010 Nissan Sentra they purchased from us at White's Auto Sales in Rensselaer, IN. 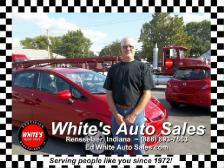 May we introduce Tim beside the 2004 Dodge Neon he purchased from us at White's Auto Sales in Rensselaer, IN. 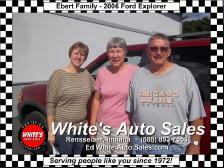 May we introduce the Ebert family beside the 2006 Ford Explorer they purchased from us at White's Auto Sales in Rensselaer, Indiana. 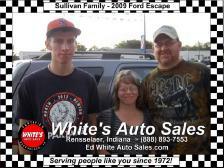 We take great pride in introducing the Sullivan family beside the 2009 Ford Escape they purchased from us at White's Auto Sales in Rensselaer, Indiana. 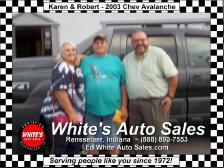 May we introduce Karen and Robert beside he 2003 Chevrolet Avalanche 1500 they purchased from us at White's Auto Sales in Rensselaer, IN. 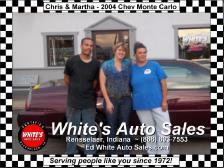 We are quite pleased to introduce Chris and Martha beside the 2004 Chevrolet Monte Carlo they purchased from us at White's Auto Sales in Rensselaer, Indiana. 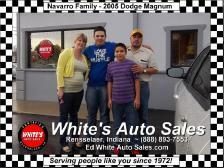 May we introduce the Navarro family beside the 2005 Dodge Magnum that Taryn and Chris (not pictured) from White's Auto Sales in Rensselaer, sold to them. 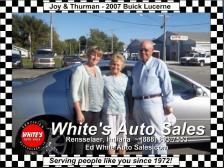 May we introduce Joy and Thurman beside the 2007 Buick Lucerne that they purchased from us at White's Auto Sales in Rensselaer, Indiana. 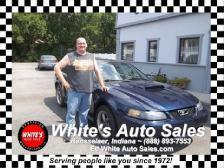 We are very pleased to introduce Joseph beside the 2004 Ford Taurus he purchased from us here at White's Auto Sales in Rensselaer, Indiana. 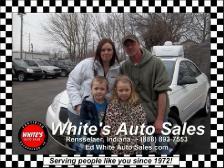 May we introduce the Frampton family beside the 2009 Buick Lucerne they purchased from us at White's Auto Sales in Rensselaer, IN. 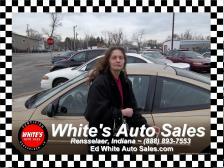 May we introduce Dan beside the 2002 Ford Taurus he purchased from us at White's Auto Sales in Rensselaer, Indiana. 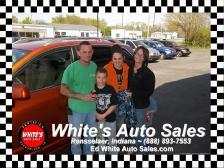 May we introduce the Sikma family beside the stunning 2008 Chrysler Pacifica they purchased from us at White's Auto Sales in Rensselaer, IN. We are honored that the City of Rensselaer chose us to supply them with a 2004 GMC K3500 dump truck for the Weston Cemetery. 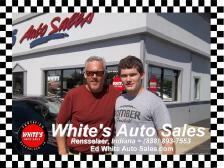 White's Auto Sales is proud to be a member of this community for the last 41 years and is looking forward to a bright future here in Rensselaer, Indiana. 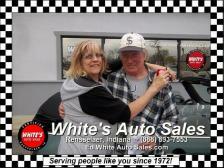 May we introduce Halleck and Phyllis as they were taking delivery of the 2003 Buick LeSabre they purchased from us at White's Auto Sales in Rensselaer, IN. 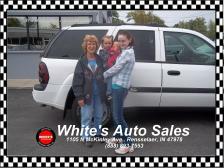 We are very pleased to introduce the Winters family beside the 2005 Pontiac Montana they purchased from us at White's Auto Sales in Rensselaer, IN. 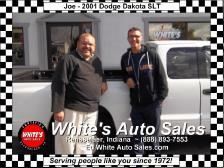 May we introduce Joe beside the 2001 Dodge Dakota SLT he purchased from us at White's Auto Sales in Rensselaer, Indiana. 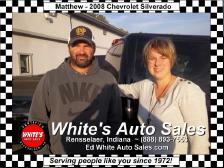 May take this opportunity to introduce Matthew with the 2008 Chevrolet Silverado 1500 4WD he purchased from us at White's Auto Sales in Rensselaer, Indiana. 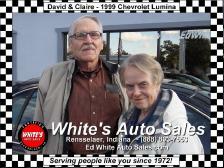 We are very pleased to introduce David and Claire beside the 1999 Chevrolet Lumina they bought from us at White's Auto Sales in Rensselaer, Indiana. 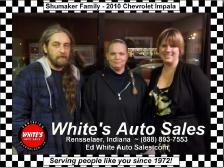 May we introduce the Shumaker family as they pick up the 2010 Chevrolet Impala they purchased from us at White's Auto Sales in Rensselaer, Indiana. 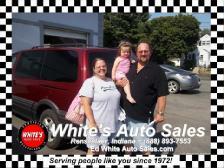 May we introduce the Spurr family beside the 2009 Ford Escape Hybrid they purchased from us at White's Auto Sales in Rensselaer, Indiana. 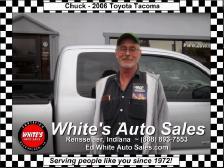 May we introduce Chuck beside the 2006 Toyota Tacoma he purchased from us at White's Auto Sales in Rensselaer, Indiana. 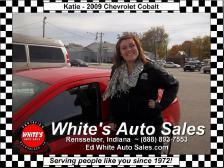 We are just as excited to introduce her as Katie is to be standing next to the 2009 Chevrolet Cobalt she got from us at White's Auto Sales in Rensselaer, IN. 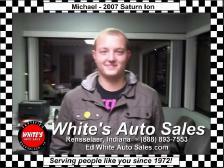 May we introduce Michael as he was taking delivery of the 2007 Saturn Ion he purchased from us at White's Auto Sales in Rensselaer, Indiana. 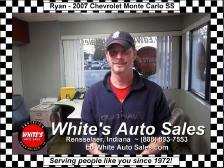 We are very pleased to introduce Ryan as he takes delivery of the 2007 Chevrolet Monte Carlo SS he purchased from us at White's Auto Sales in Rensselaer, Indiana. 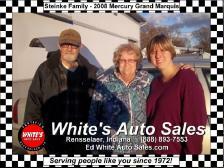 May we introduce the Steinke family beside the 2008 Mercury Grand Marquis Palm Beach Edition that the purchased from us at White's Auto Sales in Rensselaer, Indiana. 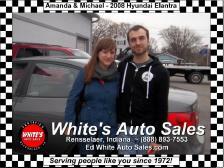 May we introduce Amanda & Michael beside the 2008 Hyundai Elantra they purchased from us at White's Auto Sales in Rensselaer, Indiana. 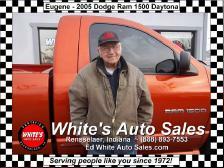 We are pleased to introduce Eugene beside the 2005 Dodge Ram 1500 Daytona he purchased from us at White's Auto Sales in Rensselaer, IN. 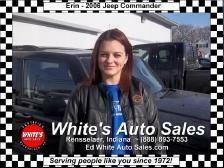 May we introduce Heidi as she is taking delivery of her 2007 Jeep Grand Cherokee that she purchased from us at White's Auto Sales in Rensselaer, Indiana. 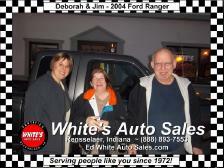 We are pleased to introduce Deborah & Jim beside the 2004 Ford Ranger 4WD they purchased from us at White's Auto Sales in Rensselaer, IN. Serving people like you since 1972! 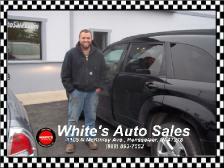 May we introduce Will as he is taking delivery of the 2009 Chrysler PT Cruiser he purchased from us at White's Auto Sales in Rensselaer, Indiana. 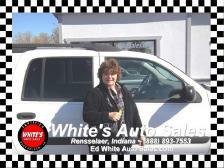 We are very pleased to introduce Shermetta as she takes delivery of the 2003 Chevrolet Trailblazer 4x4 she purchased from us at White's Auto Sales in Rensselaer, Indiana. 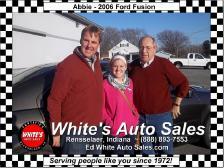 We are quite happy to introduce Abby between Troy and Ed as she takes delivery of the 2006 Ford Fusion she got from us here at White's Auto Sales in Rensselaer, IN. 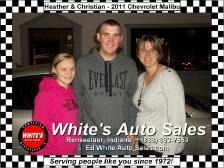 We are very pleased to introduce Heather and Christian just before they drive off in the 2011 Chevrolet Malibu they purchased from us at White's Auto Sales in Rensselaer, Indiana. 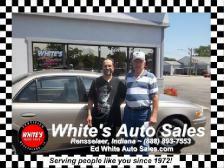 We are very pleased to introduce Harold as he takes delivery of the 2005 Chrysler 300c he purchased from us at White's Auto Sales in Rensselaer, Indiana. 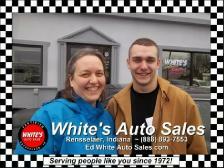 May we introduce Austin as he takes delivery of the 2005 Ford F150 Supercab he purchased from us at White's Auto Sales in Rensselaer, IN. 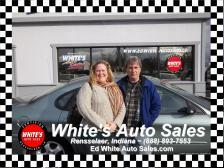 We are very happy to introduce Karen as she takes delivery of the 2003 Saturn Ion she purchased from us at White's Auto Sales in Rensselaer, Indiana. 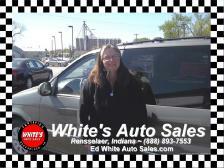 May we introduce Erin beside the 2006 Jeep Commander she purchased from us at White's Auto Sales in Rensselaer, Indiana. 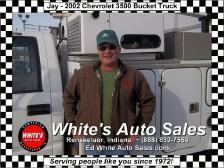 We are very pleased to introduce Jay beside the 2002 Chevrolet 3500 Utility/Bucket truck he purchased from us here at White's Auto Sales in Rensselaer, IN. 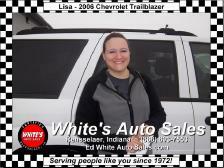 May we introduce Lisa beside the stunning 2006 Chevrolet Trailblazer she purchased from us at White's Auto Sales in Rensselaer, Indiana. 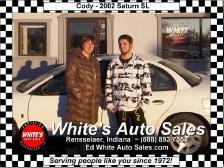 We would like to thank Christopher (not pictured) and Tiffany for their purchase of a 2003 Saturn L200 sedan from us here at White's Auto Sales in Rensselaer, IN. 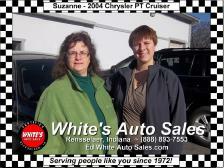 We would like to thank Suzanne for choosing us at White's Auto Sales in Rensselaer, Indiana. 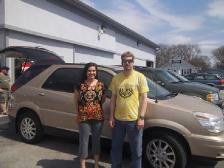 Here she is with the 2004 Chrysler PT Cruiser that she just took home. 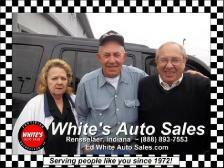 The family ad staff of White's Auto Sales would like to wish all of our customers a happy, safe and prosperous 2014. We look forward to serving your EVERY need in 2014 and beyond. 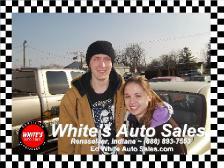 May we introduce our first customers of 2014 ... Levi and Alexandria as they pick up the 1997 Chevrolet Lumina that they bought from us at White's Auto Sales in Rensselaer, Indiana. 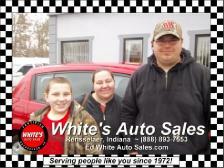 We would like to introduce the newest member of the White's Auto Sales in Rensselaer, Indiana customer family. 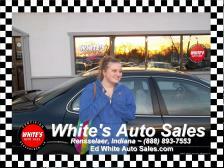 Here is Ashley beside the 2010 Chevrolet Malibu she purchased from us. 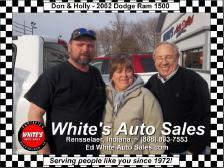 We take great pleasure to introduce our newest friends, Don and Holly with Ed beside the 2002 Dodge Ram 1500 they purchased from us here at White's Auto Sales in Rensselaer, Indiana. 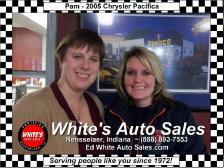 May we introduce Pam as she is picking up the 2005 Chrysler Pacifica she purchased from us at White's Auto Sales in Rensselaer, IN. 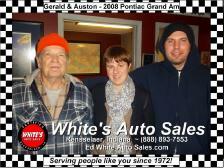 May we introduce Gerald and Auston as they pick up the 2005 Pontiac Grand Am they purchased from us at White's Auto Sales in Rensselaer, Indiana. 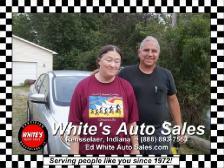 May we introduce Elizabeth and James beside the 2008 Ford Taurus X they purchased from us at White's Auto Sales in Rensselaer, IN. 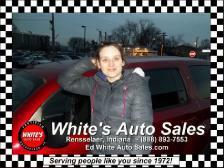 We are pleased to introduce Alex beside the 2006 Chrysler PT Cruiser she bought from us at White's Auto Sales in Rensselaer, Indiana. 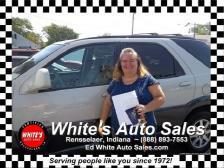 We are honored to introduce Mandy, the new owner of a 2005 Ford Escape 4WD that she purchased form us at White's Auto Sales in Rensselaer, Indiana. 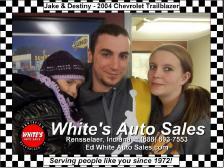 We are delighted to introduce Jake and Destiny just before they drive away in the 2004 Chevrolet Trailblazer that tey purchased from us at White's Auto Sales in Rensselaer, IN. 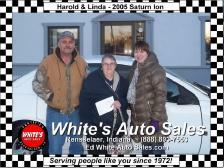 We are happy to introduce Harold and Linda, who braved sub zero weather to purchase this 2005 Saturn Ion from us at White's Auto Sales in Rensselaer, Indiana. 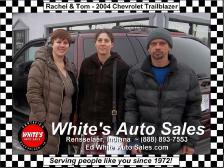 May we introduce Rachel and Tom beside the 2004 Chevrolet Tralblazer they purchased from us at White's Auto Sales in Rensselaer, Indiana. 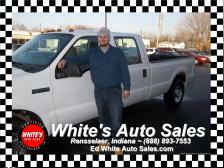 May we introduce Tim beside the 2005 Ford F350 SD 4WD Diesel Crew Lariat he purchased from us at White's Auto Sales in Rensselaer, Indiana. 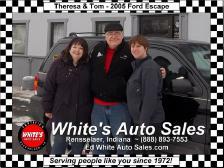 May we introduce Tom and Theresa beside the 2005 Ford Escape XLT they purchased from us at White's Auto Sales in Rensselaer, Indiana. 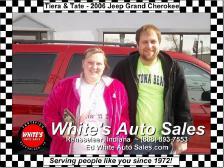 May we introduce Tiera and Tate beside the 2006 Jeep Grand Cherokee they purchased from us at White's Auto Sales in Rensselaer, Indiana. 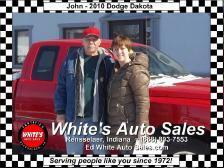 May we introduce John beside the 2010 Dodge Dakota he purchased from us at White's Auto Sales in Rensselaer, Indiana. 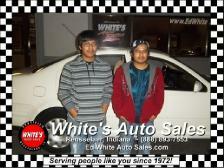 Thank you Ernie for purchasing your new Toyota Corolla from White's Auto Sales. We really appreciate your business. 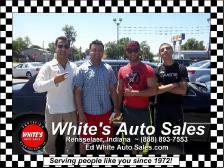 Thank You Abel for purchasing your new Chevy Camaro from White's Auto Sale! We really appreciate your business! 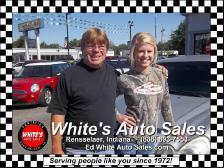 www.edwhiteautosales.com with Aschlee James. 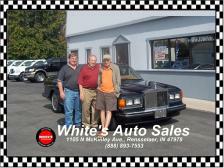 Thank You Lauretta for purchasing your Lincoln Town Car from White's Auto Sales! We really appreciate your business! 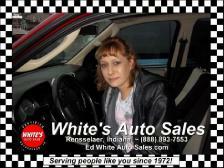 www.edwhiteautosales.com with Taryn White. 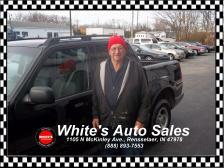 Thank you Mario for purchasing your new truck from us. We really appreciate your business.